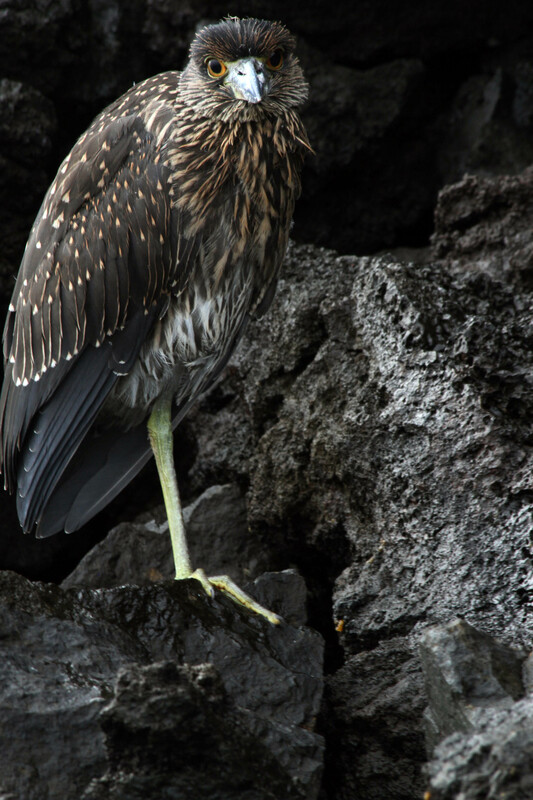 In the final post of the wonderful trip to Galapagos and Peru, I want to share some of the majesty that the islands offer. 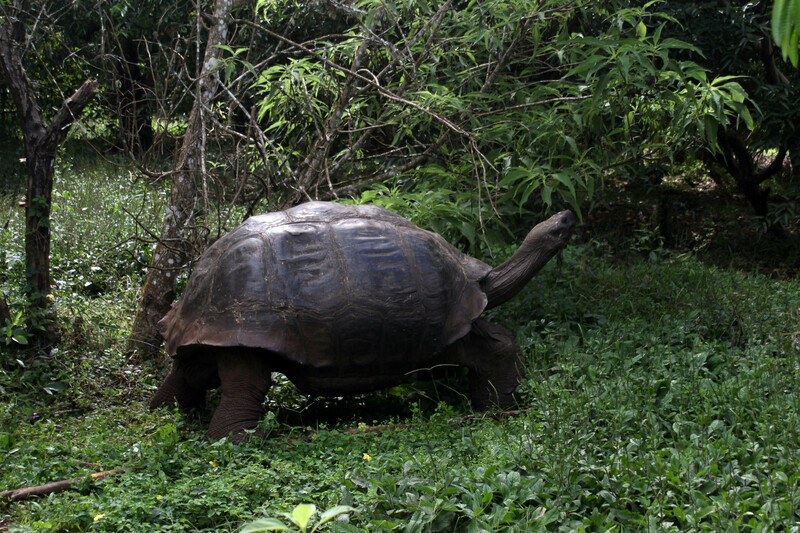 Ecuador does a great job of preserving the life on the islands, even after decades of human intrusion. 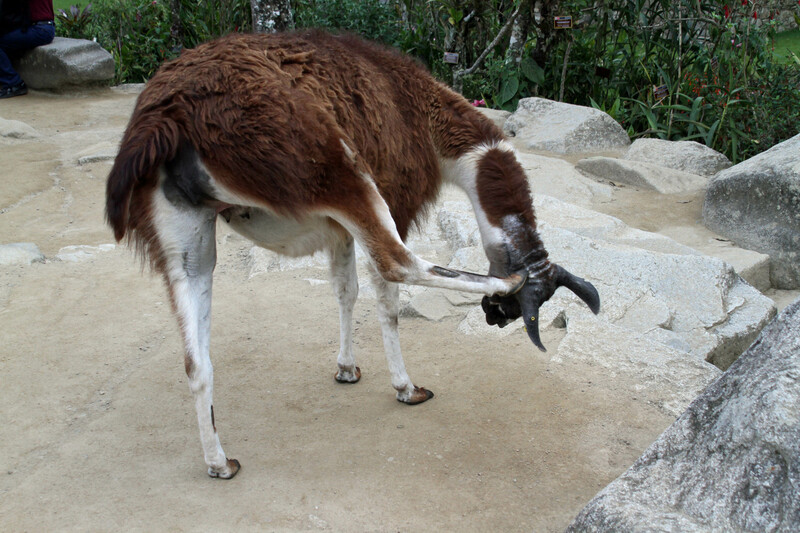 In fact on some of the islands the pirates introduced animals such as goats and donkeys. 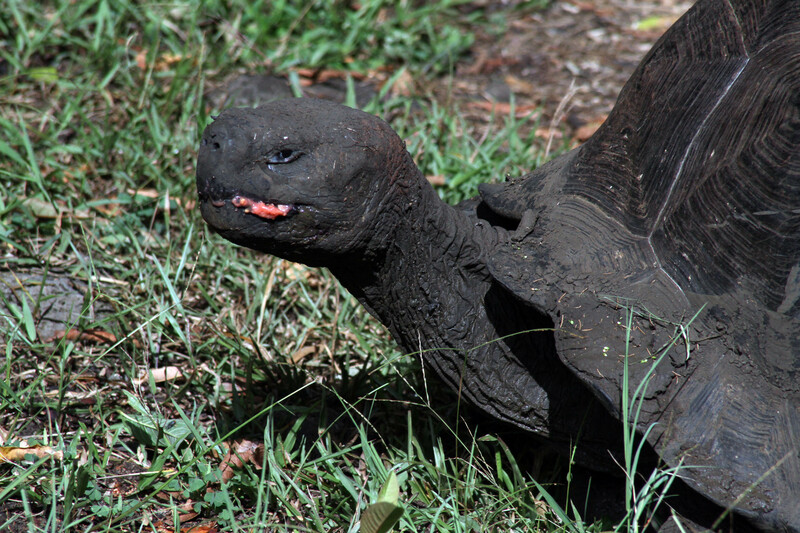 These animals wreaked havoc on the creatures endemic to the islands. Eventually many of those goats and donkeys were exterminated or removed to protect the local life. 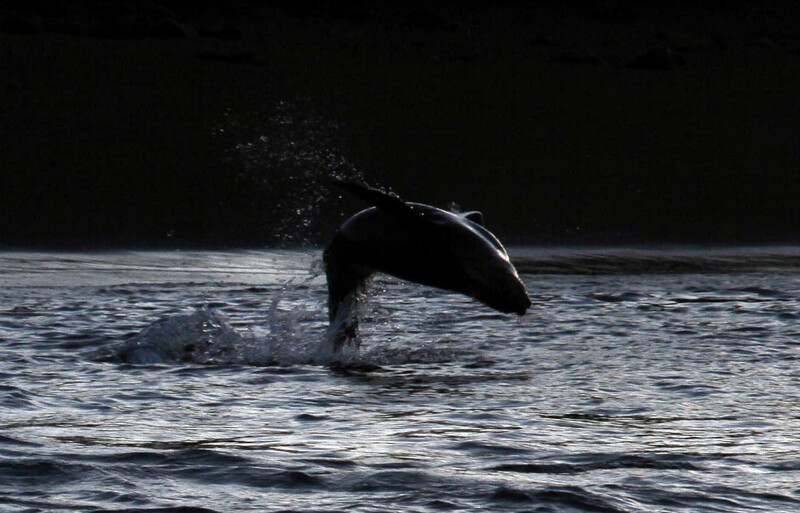 Some of what makes this place magnificent is the nature left to act in their natural habitat. You can see the various species making and having babies, protecting their eggs from predators, protecting territories, and catching their next meals. We saw a bird fighting off a frigate on his back who was trying to steal the eggs underneath in his nest. Nature can be brutal to their own as well. 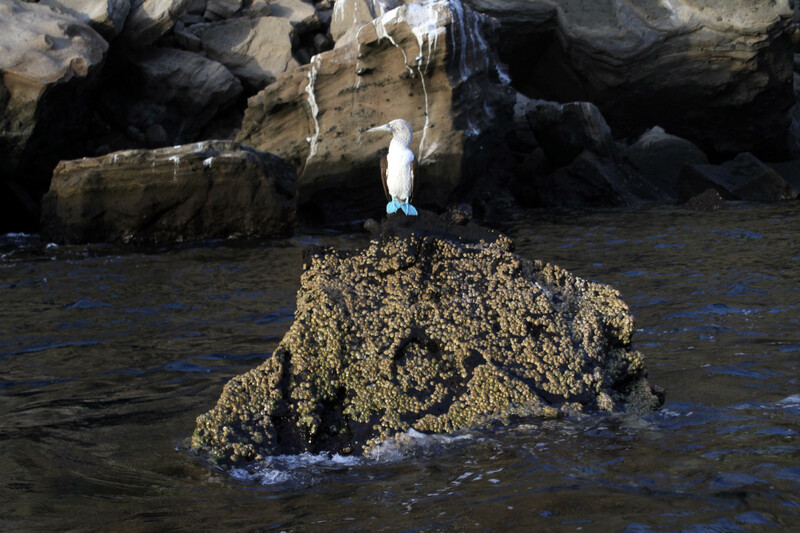 We saw Boobies warming their two eggs and were told that once one egg hatches they get rid of the next one. No spare after the heir with Boobie birds. On one beach walk, we came across the saddest part of the trip—nature again playing Darwin’s survival of the fittest game. A cute baby sea lion was obviously very hungry as he walked around and then rested due to weakness from lack of sustenance. We could see his rib cage—a sign he hadn’t eaten in a while. His mommy may have been hurt or gone. This little guy was pleading with and slowly chasing another adult female to try to get some milk. 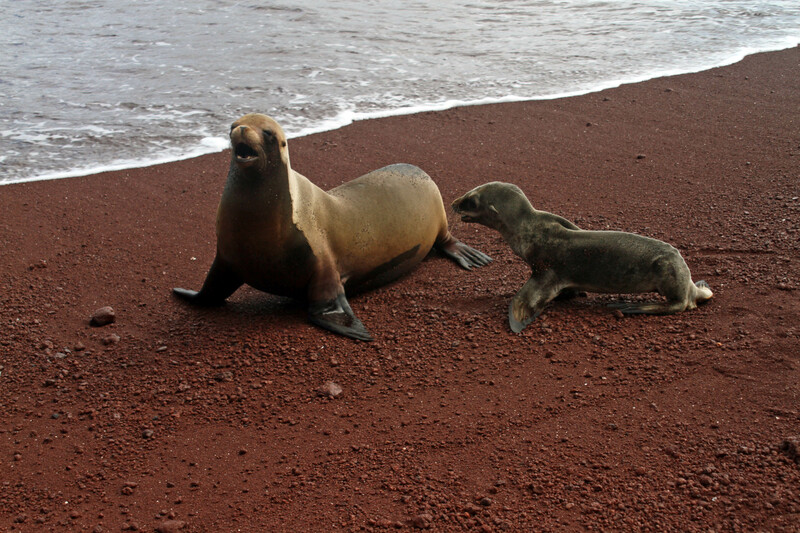 Unfortunately they don’t do adoptions in the sea lion world so the female kept moving away from the baby. She was saving her resources for her own young. I prayed his mommy would show up soon. 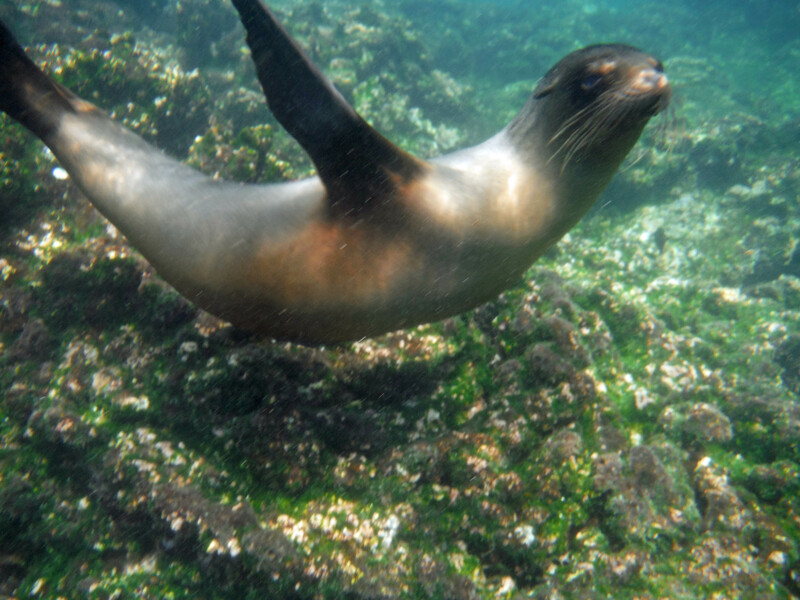 In brighter news, the snorkeling was fantastic, and the most fun part was the sea lions swimming around you and playing. 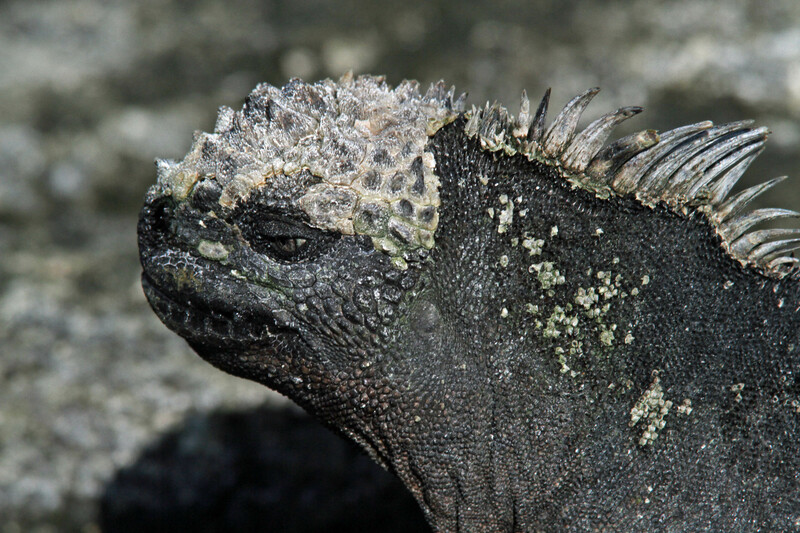 There were also marine iguanas eating the algae on the rocks under the water as well as huge turtles. 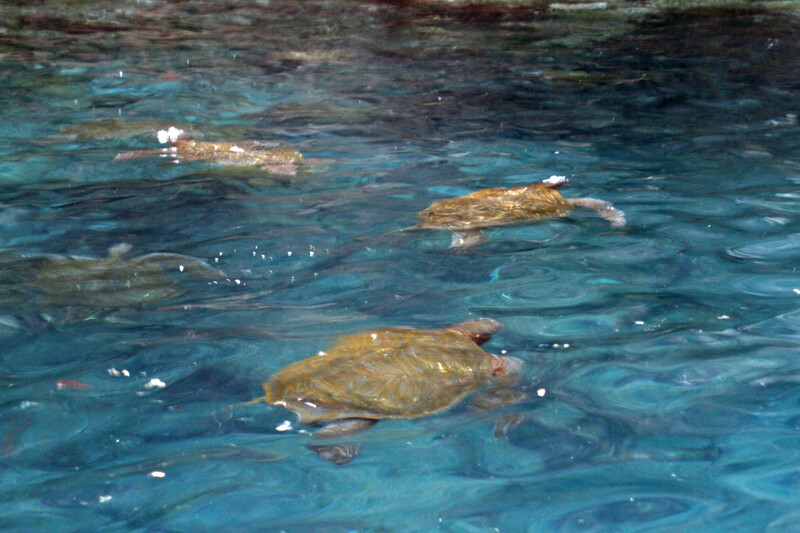 The turtles were slow unless a boat or a person were coming on them and then they could scoot away. It was a bit startling at times though to turn around and see one right in front of you. After seeing some beautiful fish, we got back to the boat with white fingers from the cold water, to soak in the hot tub for a bit before our nightly happy hour. 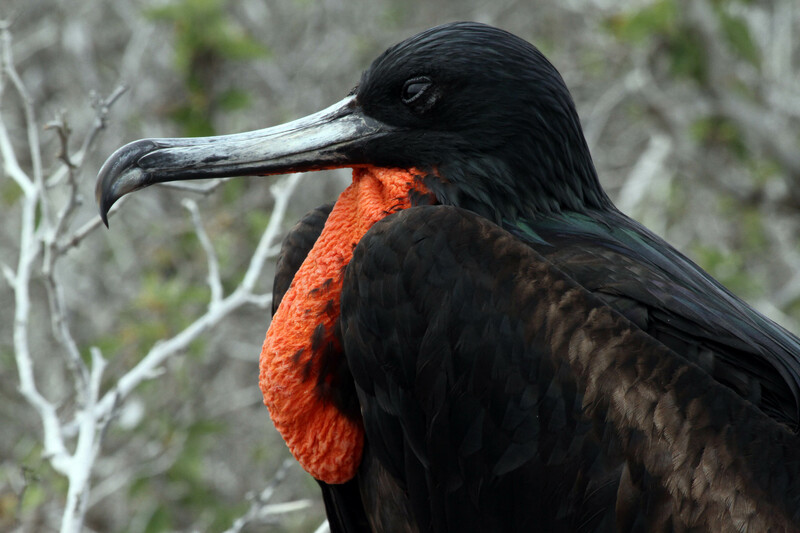 Taking a walk along the shoreline on one island, we saw a number of frigates—the males trying to attract the females by enlarging the pouch under their chin. 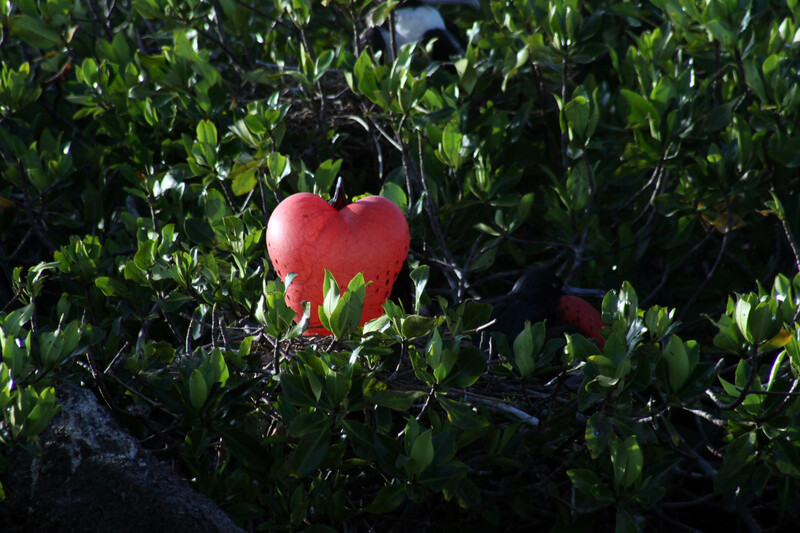 When “inflated” it looked like a red heart. When the ladies flew overhead, they would make a lot of noise, show their pouches, and spread their wings wide—look at me dahlin! 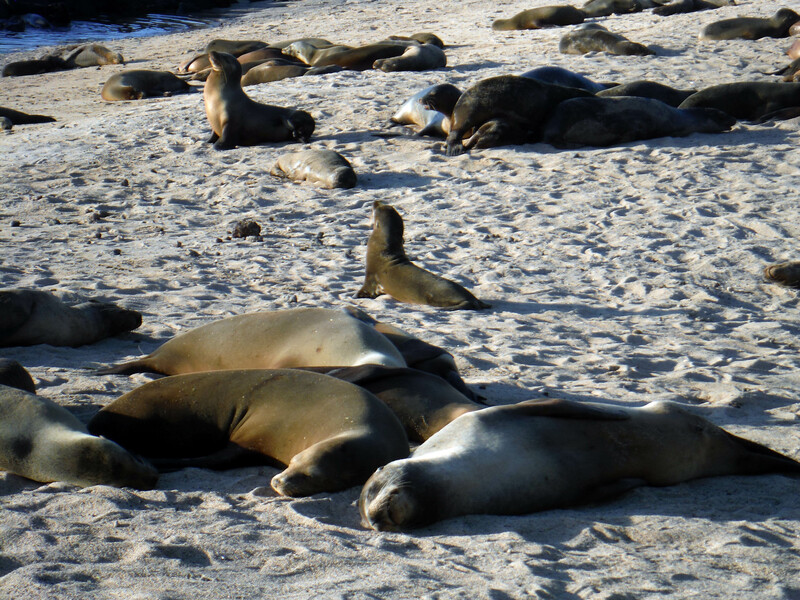 We also saw more sea lions and were told by the guide that sometimes you’ll see a beach boss—one guy who “owned” that beach for him and his women. If there were lots of ladies, he would be higher up on the hierarchy. 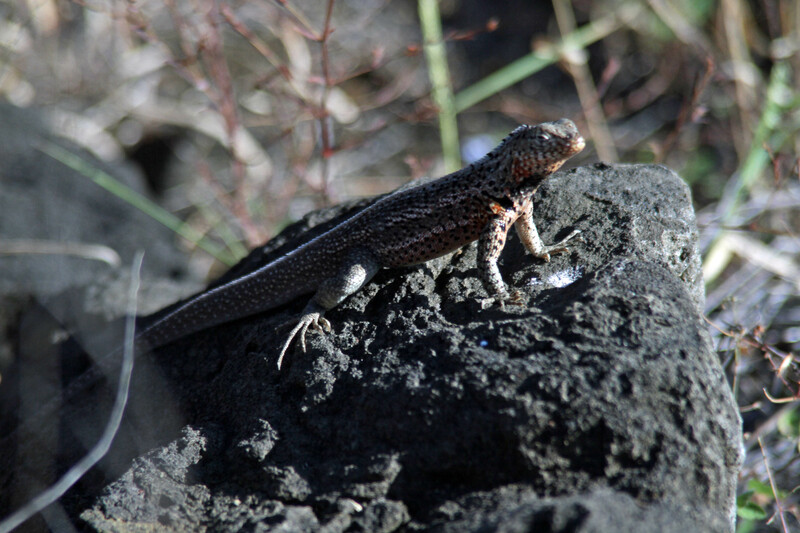 On another island we saw a number of the colorful land iguanas. They moved slowly and the males seemed more colorful. At one point, two males were competing for a female’s attention. The swimming and hiking wiped me out. 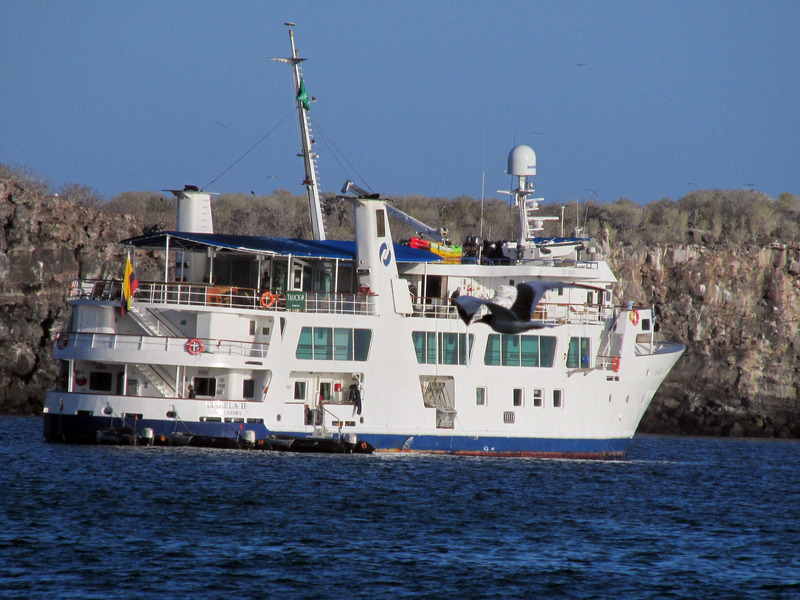 Thankfully we took afternoon rides on zodiacs and saw many wonderful animals and geographical sites. 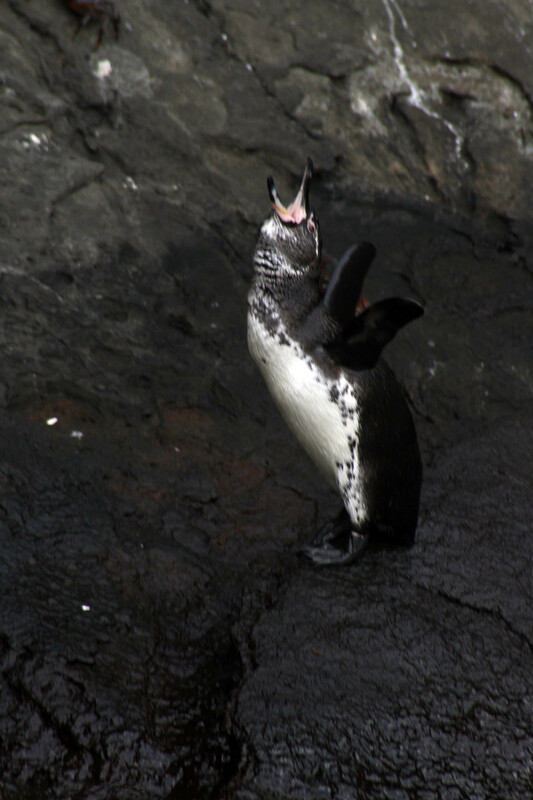 On one island, we saw lots of Galapagos penguins swimming around. The ones we saw getting in and out of the water were pretty cute. 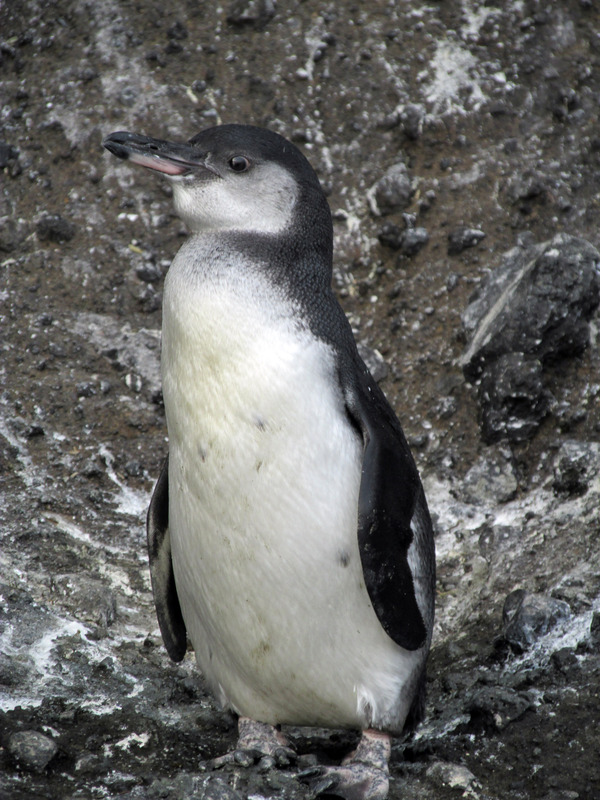 It was fascinating to see penguins outside of a zoo and not in the freezing Antarctic. Back on the boat, we had fun seeing birds that would catch rides between islands. And at one point a sea lion jumped on our stairs to catch a ride but was blocked by crew standing near the entrance. 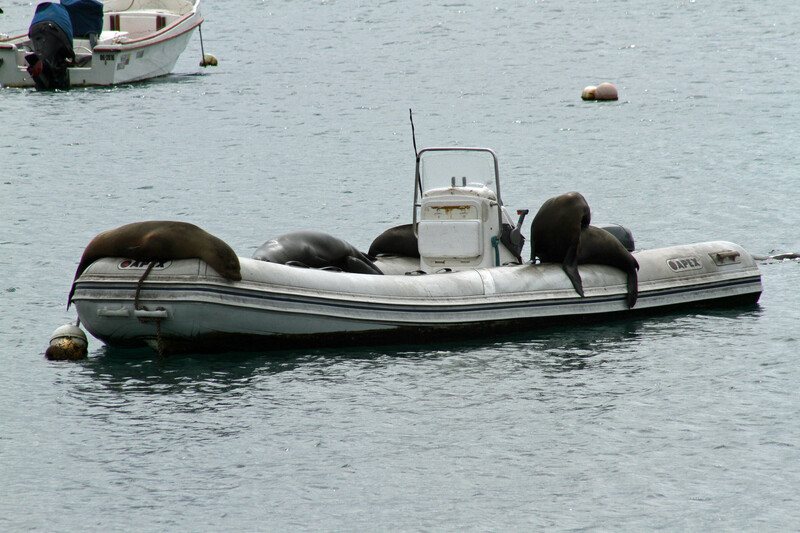 The crew couldn’t touch the sea lion but maybe their presence hindered his objective of a free ride. 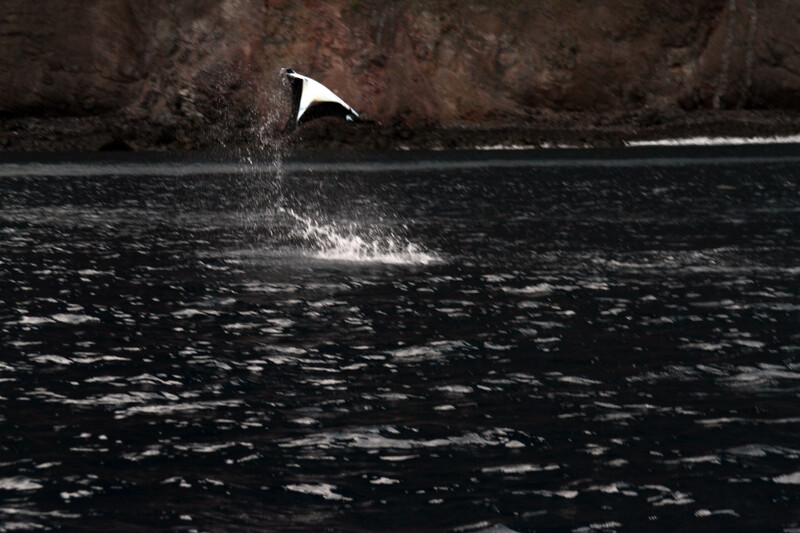 Later he jumped on a zodiac that was parked along the side of the boat. Our happy hour was on the deck that night as we had a final crossing the equator party. It was beautiful with the sun setting and was our seventh crossing (six on the boat, one by plane and we had one more to go to get home). They gave us certificates with new names given to us by King Neptune—mine was Sergeant Major. 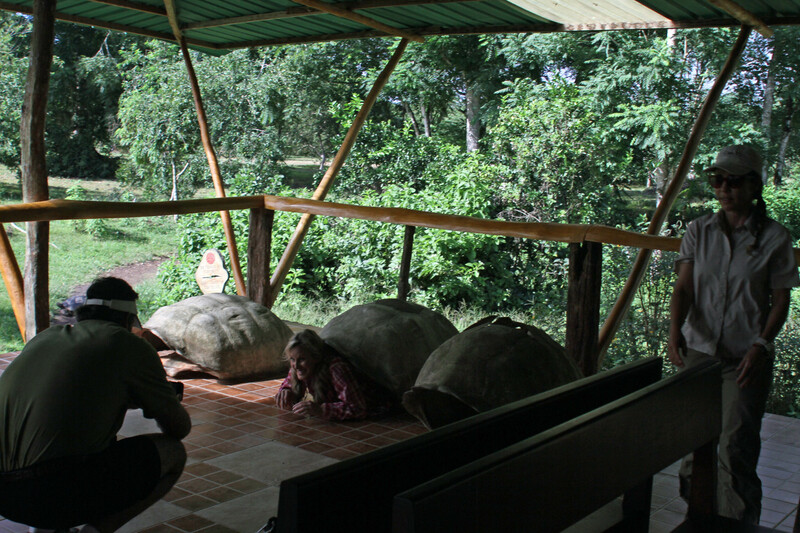 Our final tour of the trip was on land to a special tortoise sanctuary. There were some seriously big boys there. They were all over—lots of them in the mud pits. We got pretty close to a few of them. And a few people in our group climbed into big shells they had at the center to see how it feels to wear one. A bus trip through lovely scenery took us back to a dock and then on to a tiny airport for our flight back to the mainland. A final night in Ecuador with a lovely goodbye dinner was festive. We had an amazing group—really one of the most fun we’ve ever had with Tauck. 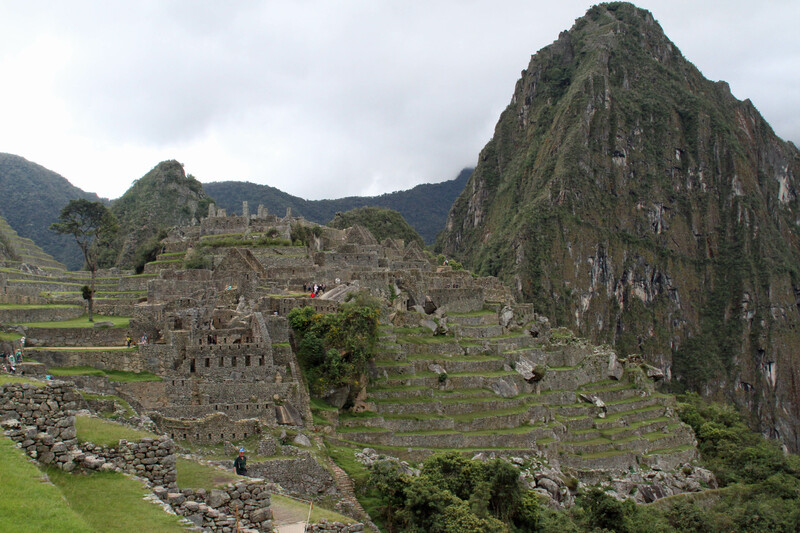 I highly recommend a trip to these two countries—Peru and Ecuador. The people were nice and interesting, the scenery was breathtaking, and the history was rich and filled with a mixture of religions and cultures. 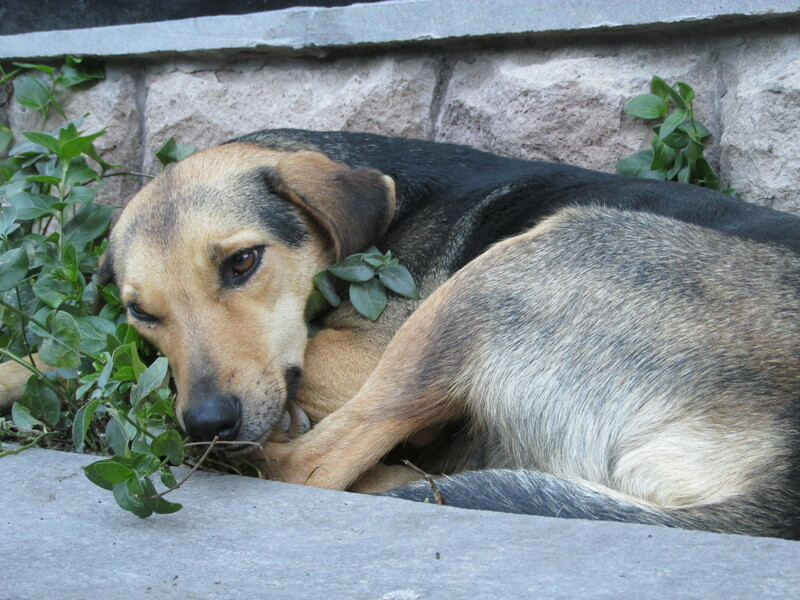 It once again grew our hearts and our compassion for our earth and the animals and people in it. We had a few hours of sleep and a cold shower before taking a nice trip back to the states. It was exhausting but once again, mom, dad, and I had an amazing family experience. We are currently throwing darts at the map to see where we land next! Until then, buenas noches! The sea lion trying to board without a ticket. 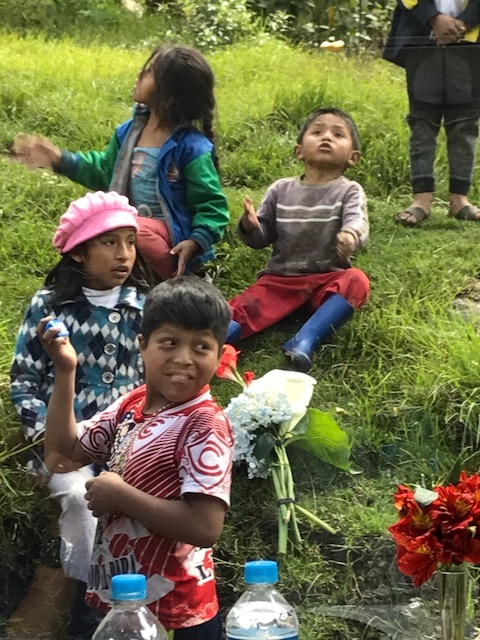 Kids in Peru singing a drinking song to make money off of tourists. Sea lions are the new cats. Sea lions hanging out on someone’s panga. 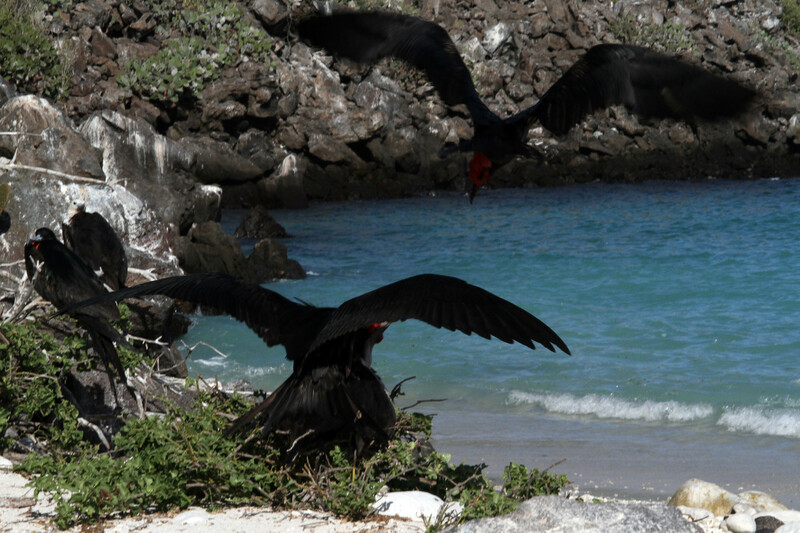 I was super excited to visit the Galapagos Islands. I felt almost rewarded after the experience of having to go through my evolution class in college and reading The Evolution of the Species by Charles Darwin. Now, before I lose you reader, please know I will not reproduce the entire excruciating details of that said publication and will mostly be talking as a tourist having fun in a magnificent environment with beautiful animals and birds. Beach time at San Cristobal. 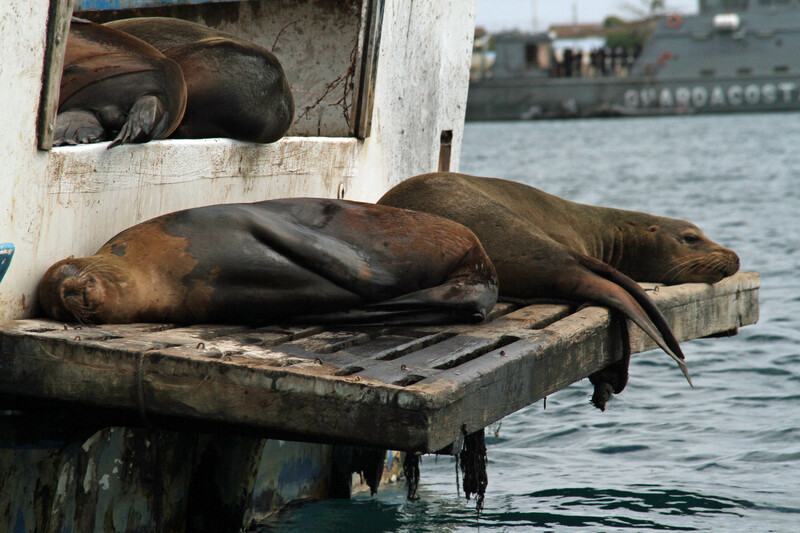 When we arrived at San Cristobel island we were immediately delighted at the sight of sea lions making themselves at home basically anywhere; on the steps and the platforms to the boats, on the streets, on boats (if you leave it too close and too long near the land), etc. 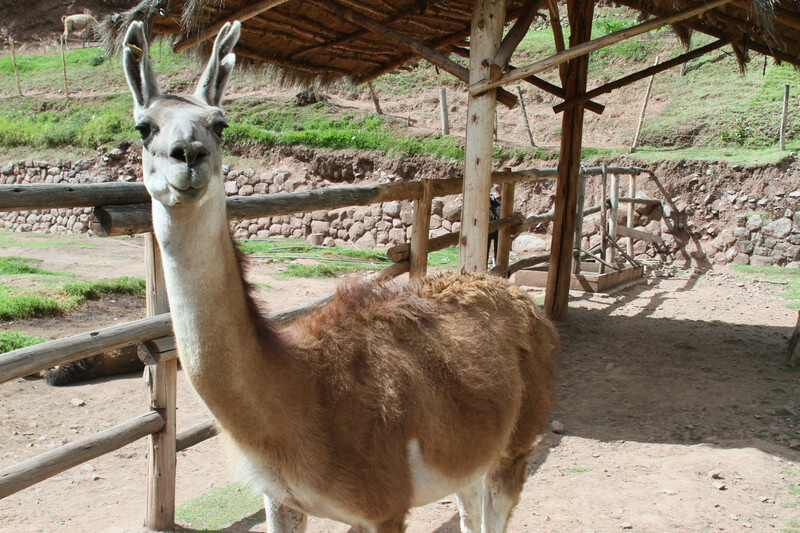 Our guides told us you can’t touch the animals here so some of them get used to that and feel free and comfortable. Sometimes that means you have to leave them be as they take up space on the boat you are riding on at the moment. The crazy stairs we climbed on Genovese. Our cruise ship was very comfortable and had 22 guest rooms. My parents and I got the rooms in the stern and there was plenty of room. 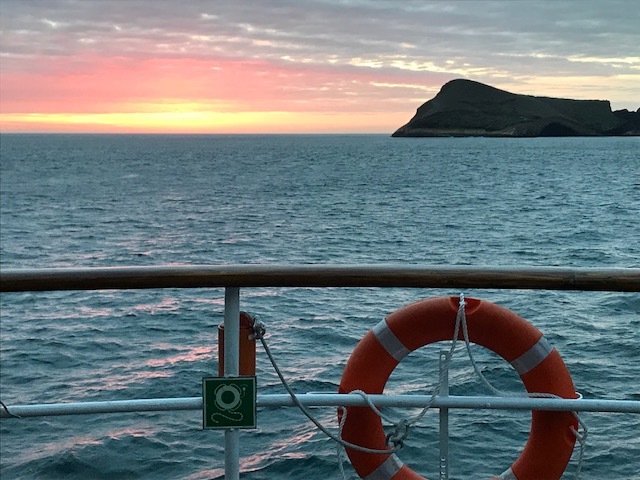 An early wake up found us in the northern hemisphere anchored in the Great Darwin Bay at the island of Genovese where we took a 1.5 mile walk across some hard terrain of lava rocks. 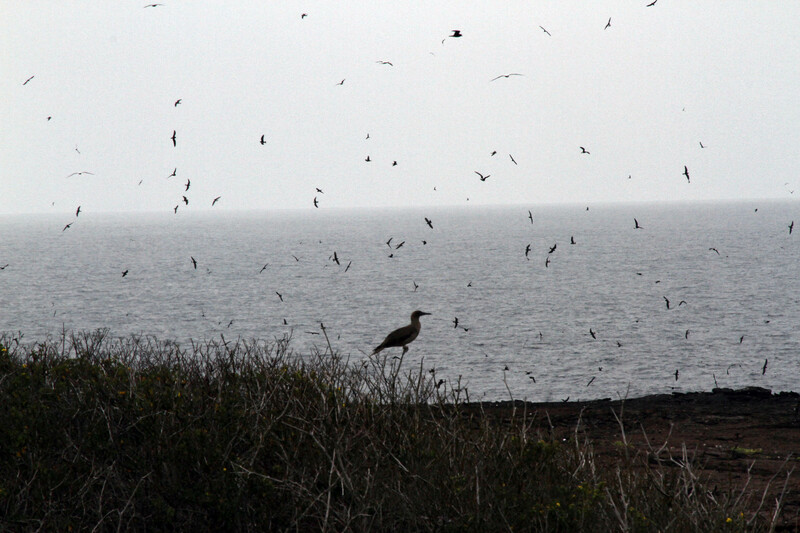 Here we saw a lot of red footed and Nazca boobies. 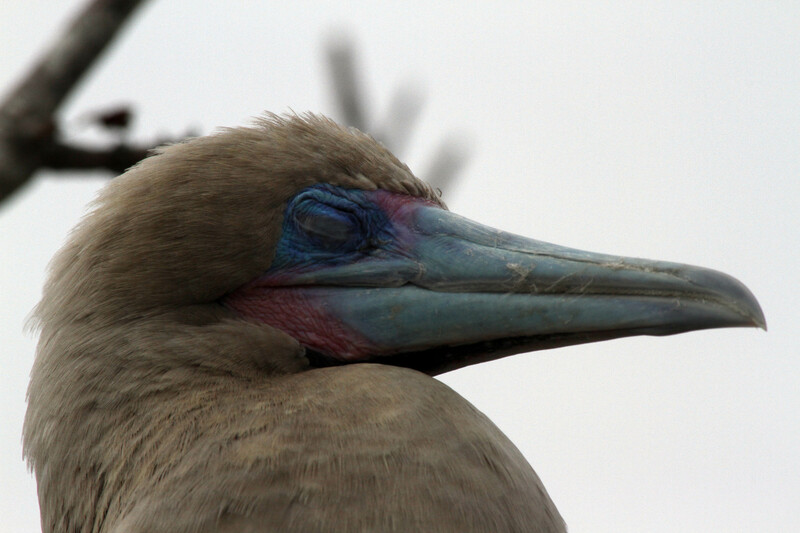 Lots of other species of birds were nesting everywhere. 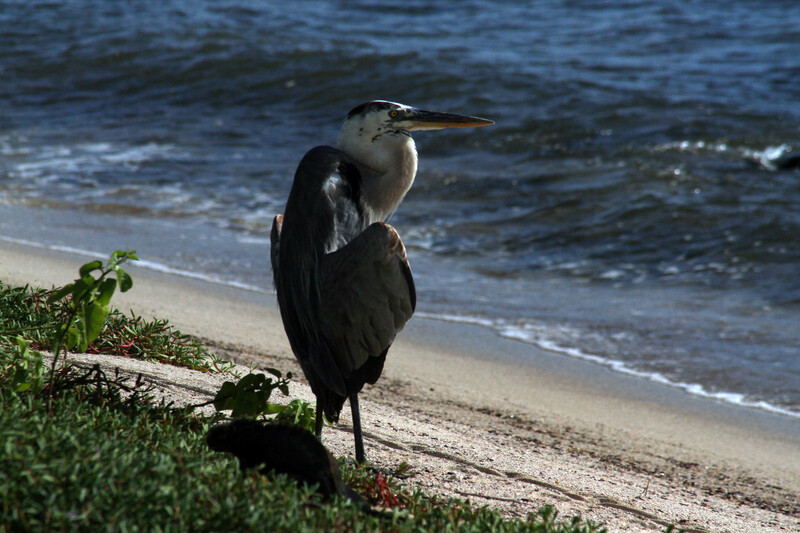 There were frigates, hawks, swallow-tail gulls, mockingbirds and finches. The Prince Philip Stairs where we caught our zodiac was a scary 90 ft decent and not for the clumsy types. In the afternoon we took a short beach walk on the other side and then went for a snorkel. 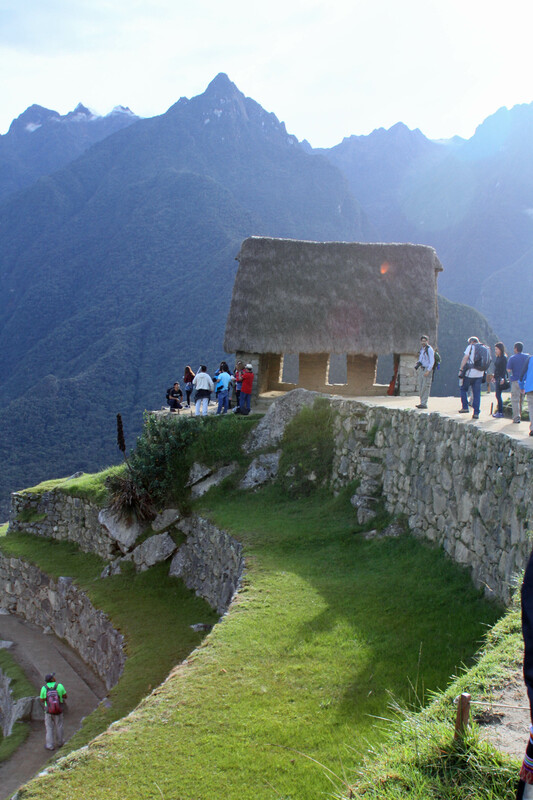 It was a very busy and physical itinerary. 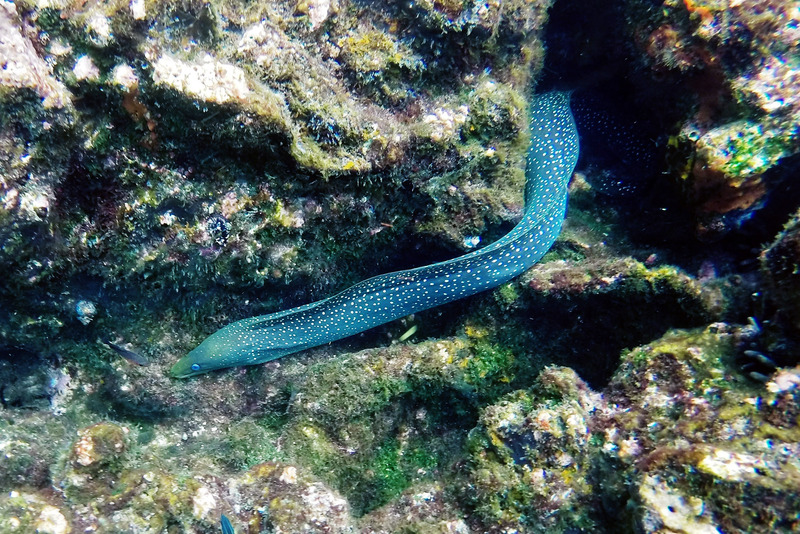 The snorkeling gave us views of colorful fish, barnacles, and a very rare eel. 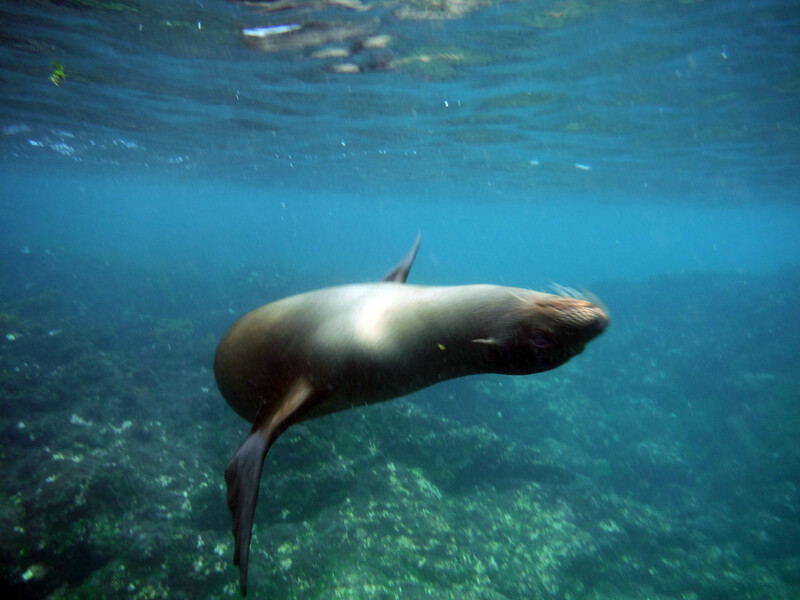 The most fun thing I liked on these snorkels were the sea lions. 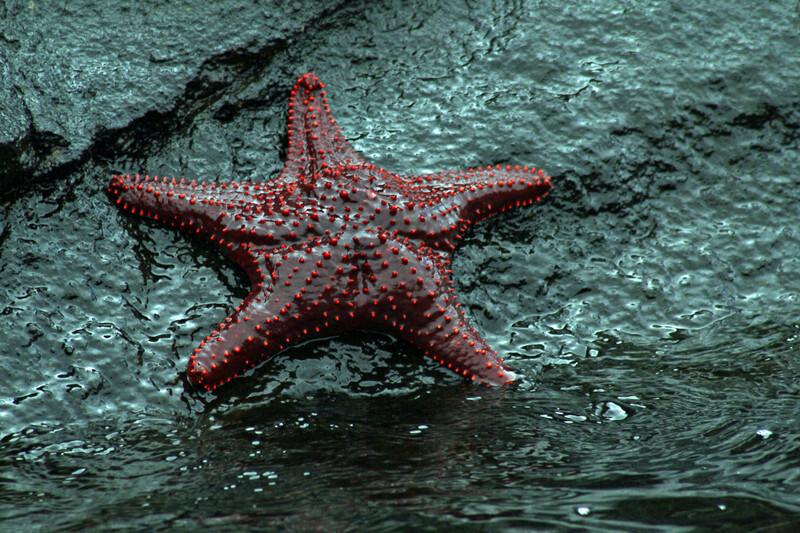 They would swim around you and play, coming up close to you then spinning away at the last second. 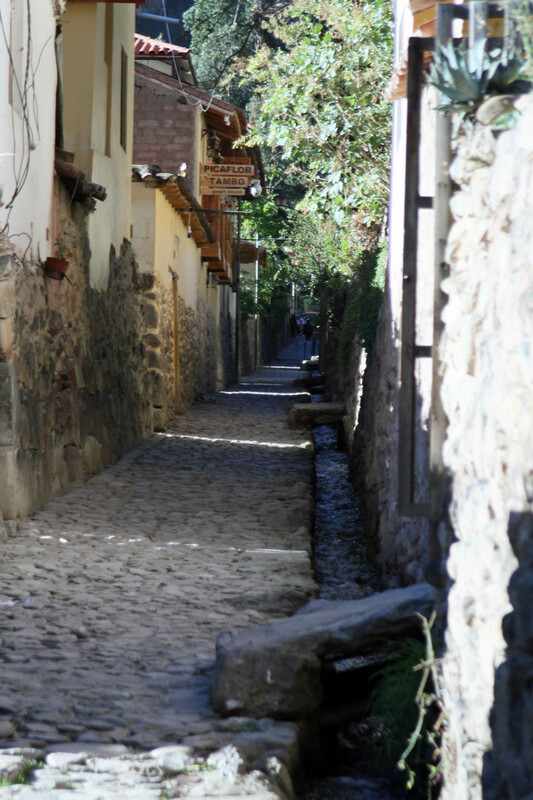 Our next stop, back down in the southern hemisphere, was to Santiago, an old pirate stop. 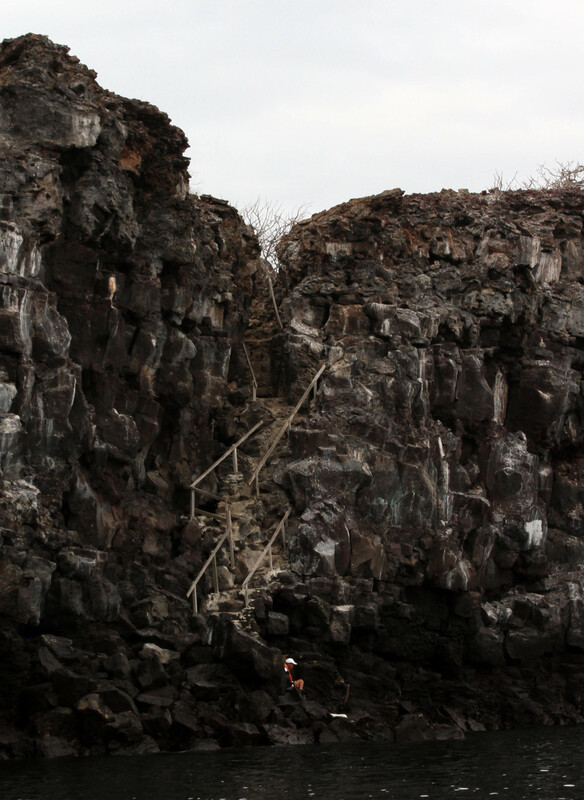 We started off up some rocky stairs avoiding the baby sea lion and his mama on the rocks and took a long stroll through the paths in the island seeing a ton of lizards and birds. 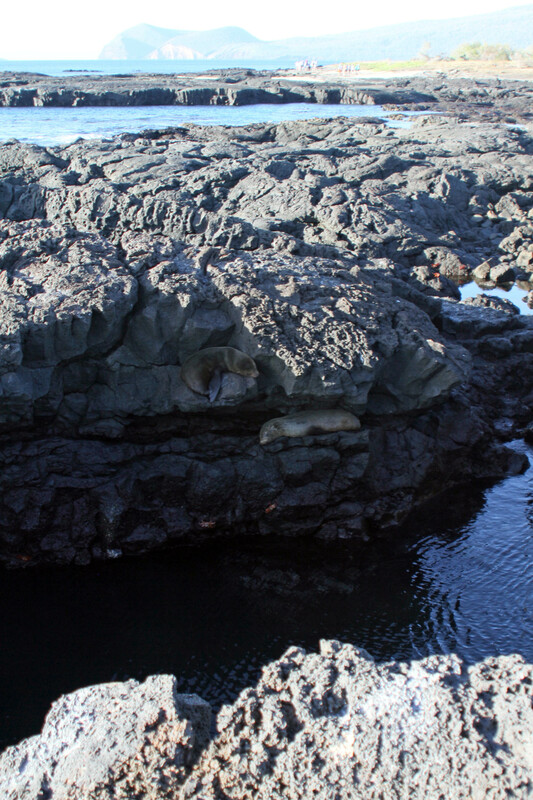 And also along the shoreline where the sea lions would climb up (how I’m not sure) into cozy spots to sleep. 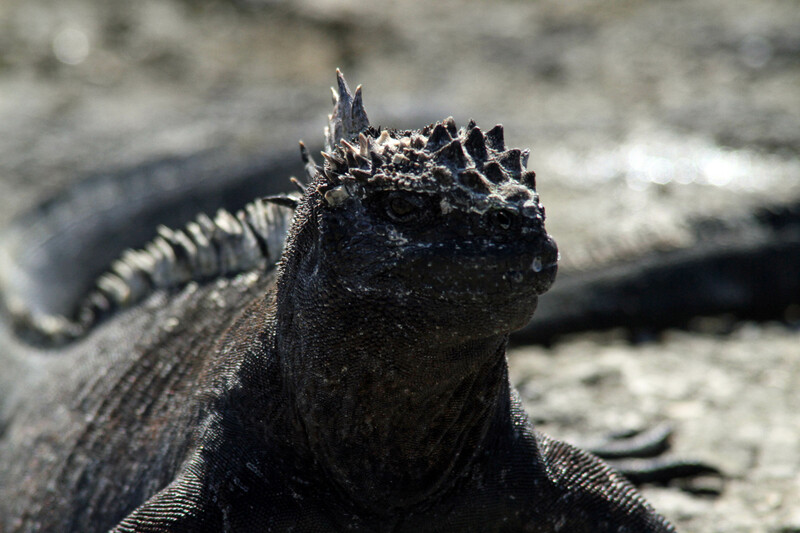 We had to watch our step because the marine iguanas were everywhere. They look like prehistoric scary predators but in reality were algae-eating, slow moving, sun-soaking, and fascinating to observe. 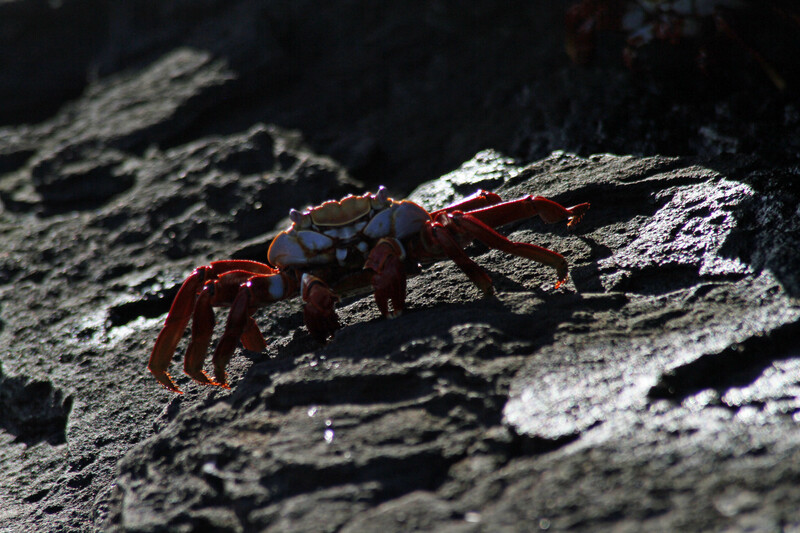 All of the animals would co-exist and sleep near each other including Sally Lightfoot crabs who had beautiful red markings. The terrain was very interesting and full of lava formations, low trees, and random rock formations. Our days normally consisted of walks, rides in the pangas (zodiacs) along the coast lines, and swims. 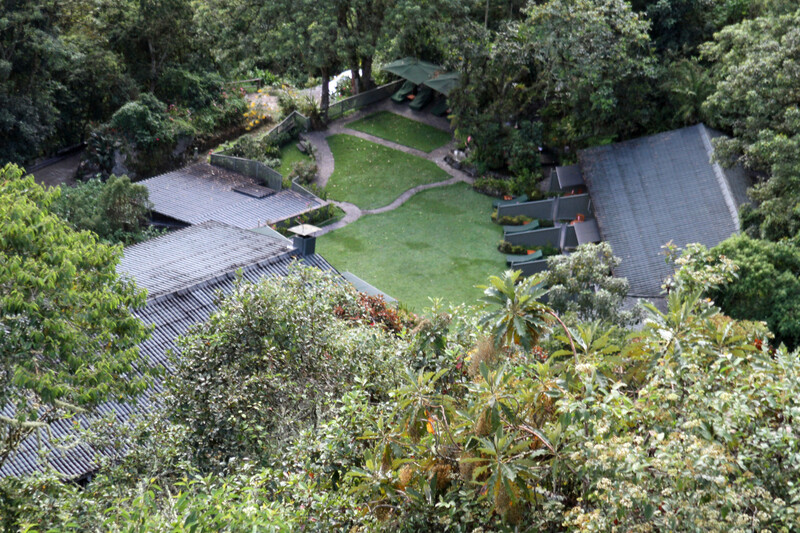 Next post covers some more back and forth across the equator and around the islands. 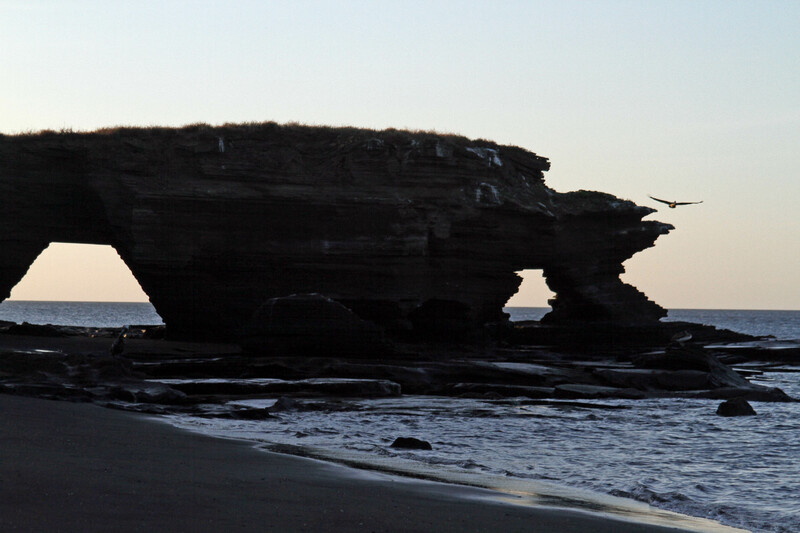 Cool rock formations where pirates used to store their riches. Can you spot the sea lion and guess how he got there? 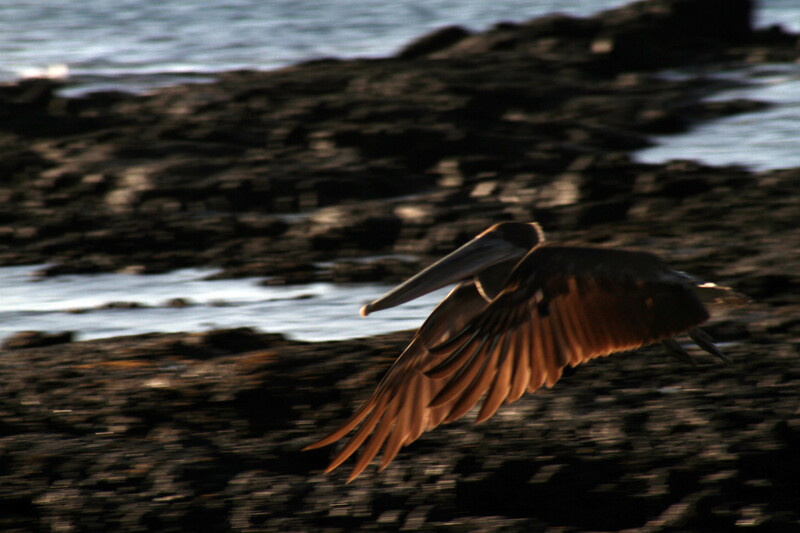 Pelicans were everywhere and beautiful in flight. Sally Lightfoot crabs crawled all over the rocks, other animals, etc. Black as babies, they get colorful as adults. Lizards (or salamanders?) scurried across our path. The females had red heads and the males would do push ups to try to get their attention. 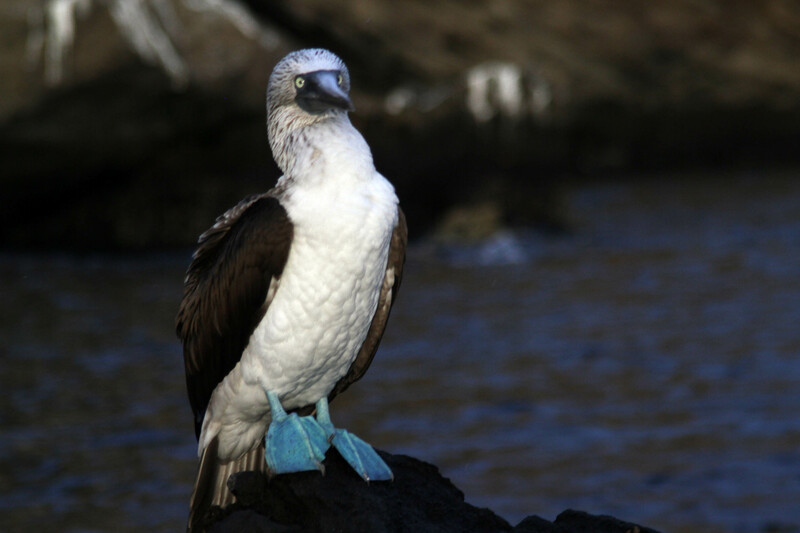 The red-footed booby has a beautiful blue face. 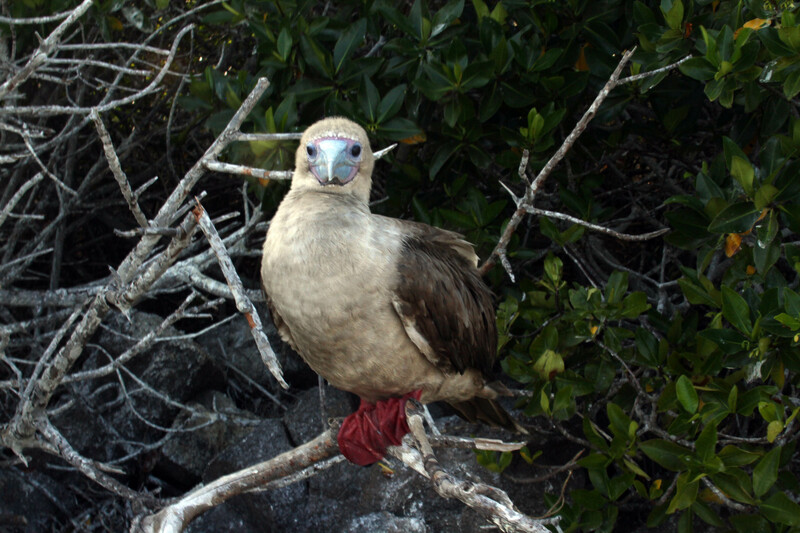 Male frigate. His pouch is deflated–time to eat. Tons of birds fly around on Genevosa. This guy stands on one leg. Sleeping in the sun on an abandoned boat, because we can. A rare glimpse at an eel while snorkeling. Our ship the Isabella II. Swimming with my new friends. 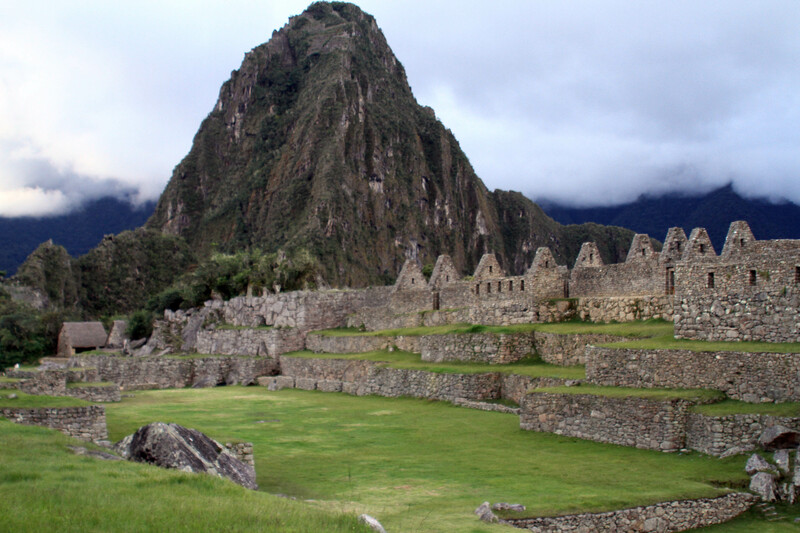 Peruvian entrepreneurs and religious traditions. Curious kids entertaining our train and hoping for some handouts. 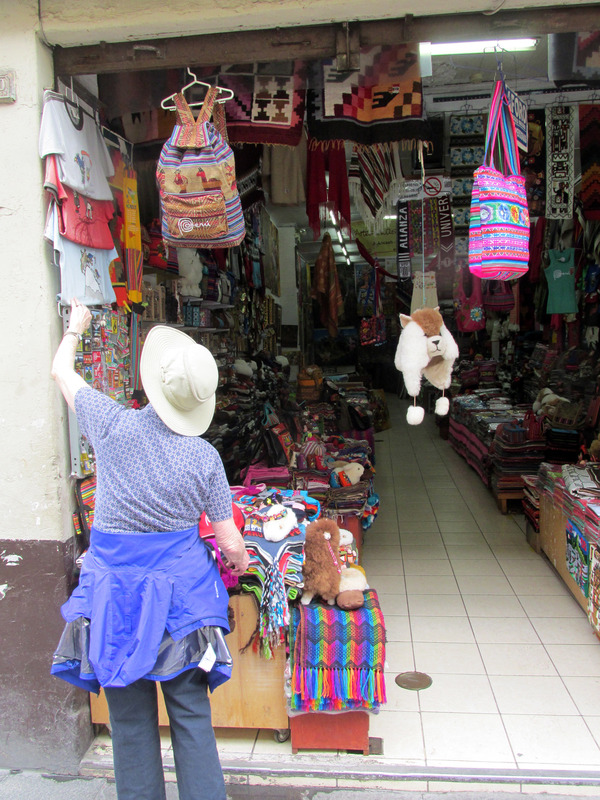 The Peru and Galapagos trip continues with our final days in Peru. 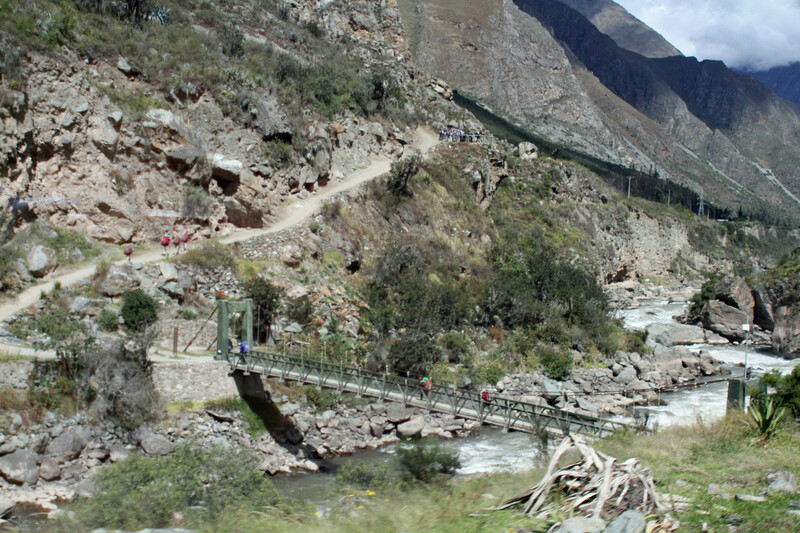 With my Fitbit registering a ton of steps and my knees sore, it was a relief to go by bus and train from Machu Picchu back to Cusco. 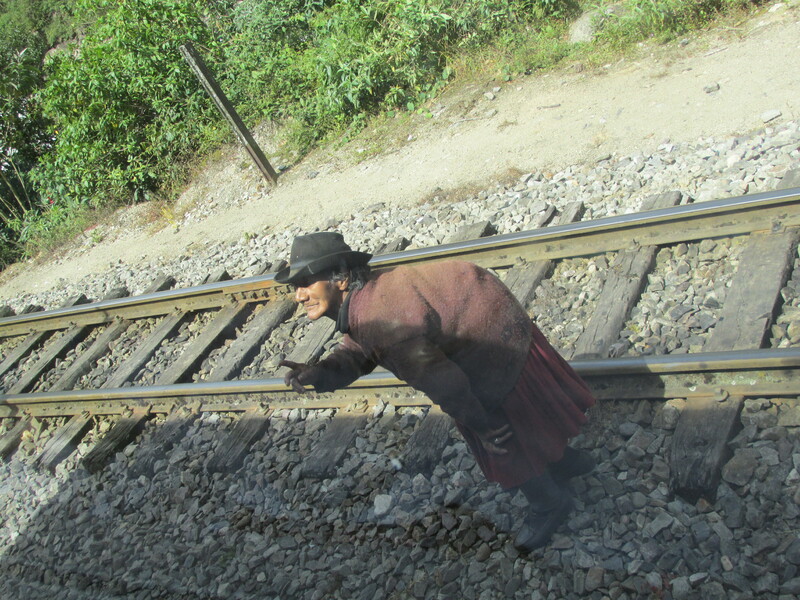 The train had to stop a few times and we would see some locals asking for money. It’s always a reminder of how well off we are and how just a few dollars can make a difference to their day. 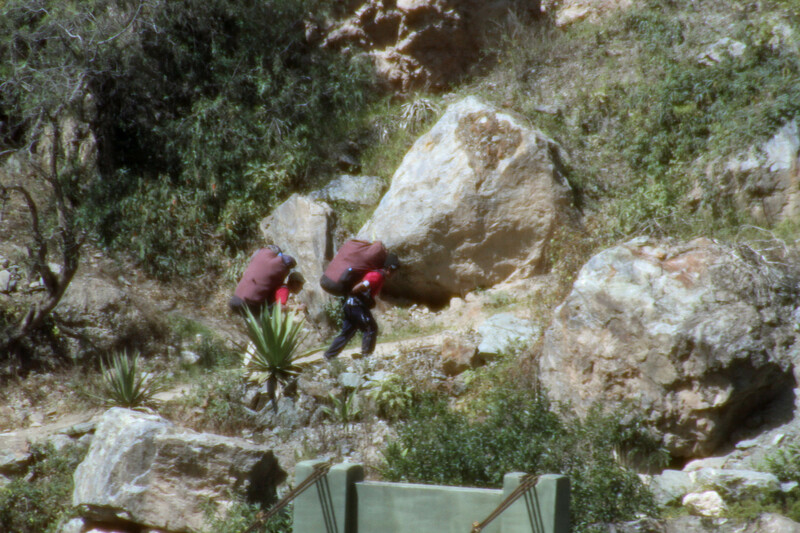 We saw a local women who looked elderly and her back was bent pretty bad—probably from years of hard work. So many of these people like to be self-employed. 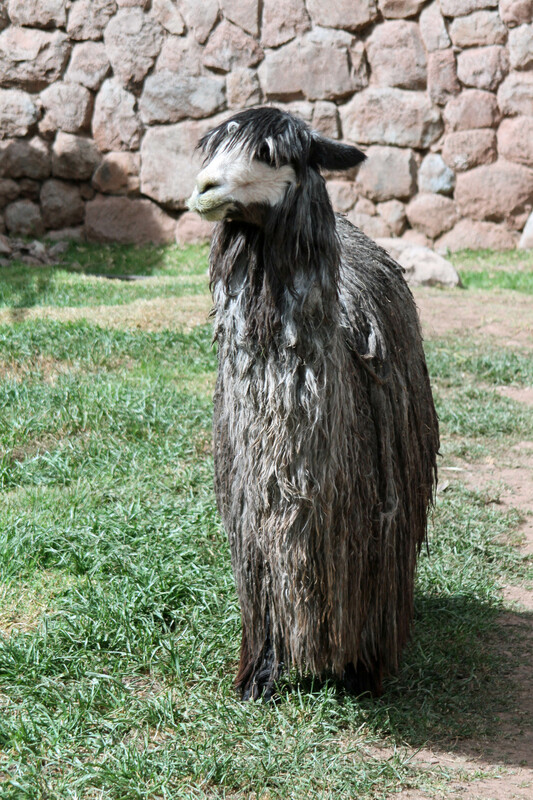 We met a few of them all over the Cusco/Machu Picchu region as they were friends of our tour guide. They called themselves names such as Diana Ross and George Washington. As a marketing professional, I can say I am impressed by this tactic. 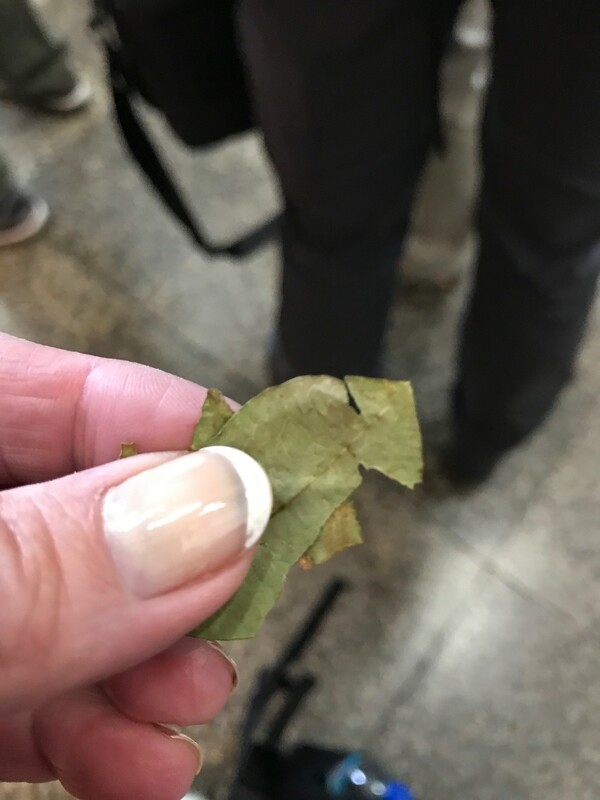 Coca leaves to chew on to help with the elevation were in a big bowl at the airport. I preferred the candy and tea versions. 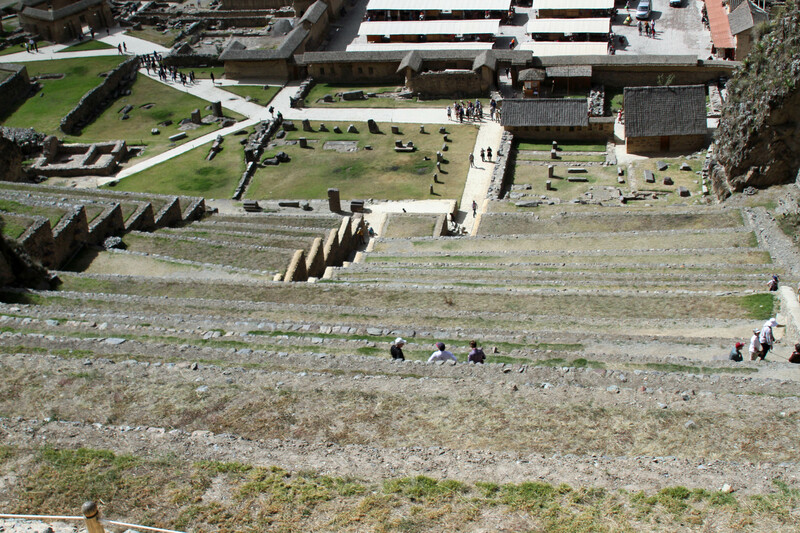 Back in Cusco, the elevation was making me take deep breaths and hurt my lungs and head a bit. 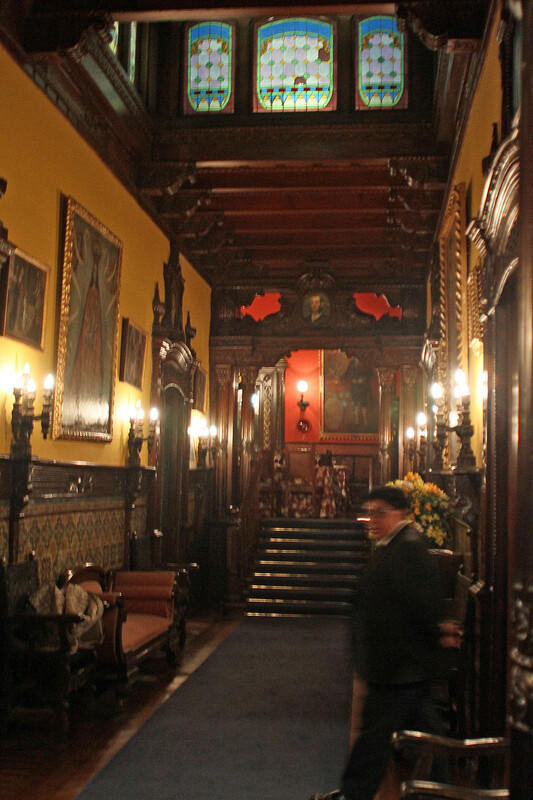 Our hotel was really interesting—it was an old monastery and each room had a lot of character. 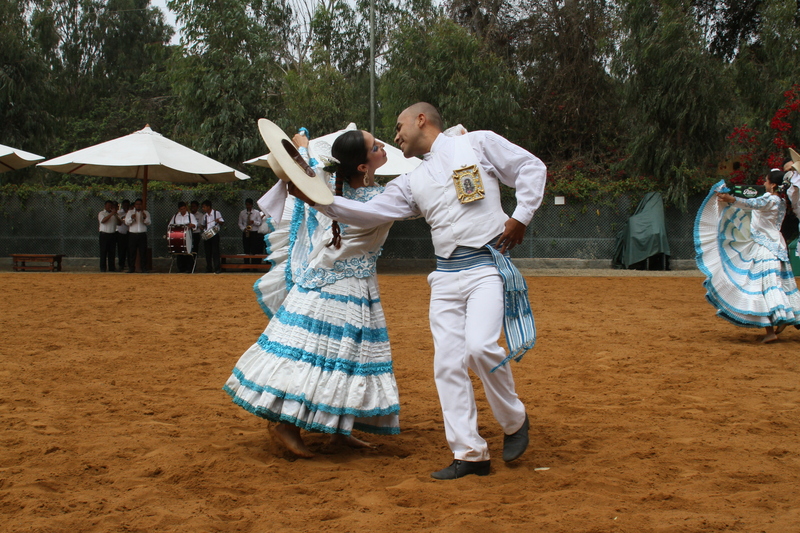 We took a tour around town to a cathedral and enjoyed a big party and parades going on around the main square. 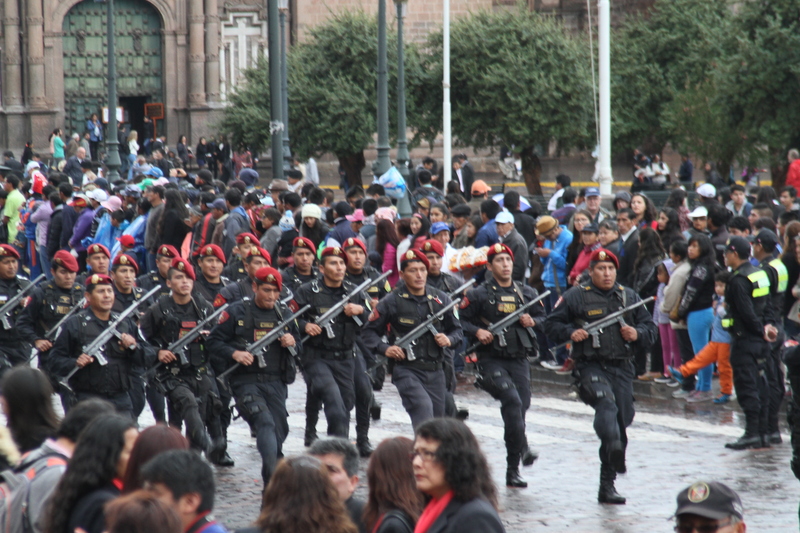 We saw military members walking with those old German type straight steps, guys dressed in cowboy outfits shaking beer and spraying it around, college groups dressed in black and white business clothes, and more. We were told there are so many “holidays” that get celebrated there were too many to count or know all of them. 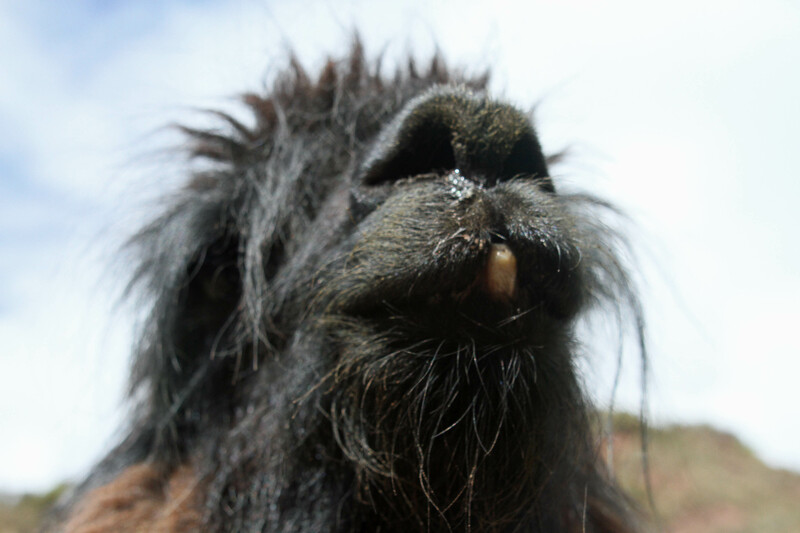 We went to a lama/alpaca farm where they let us feed them. 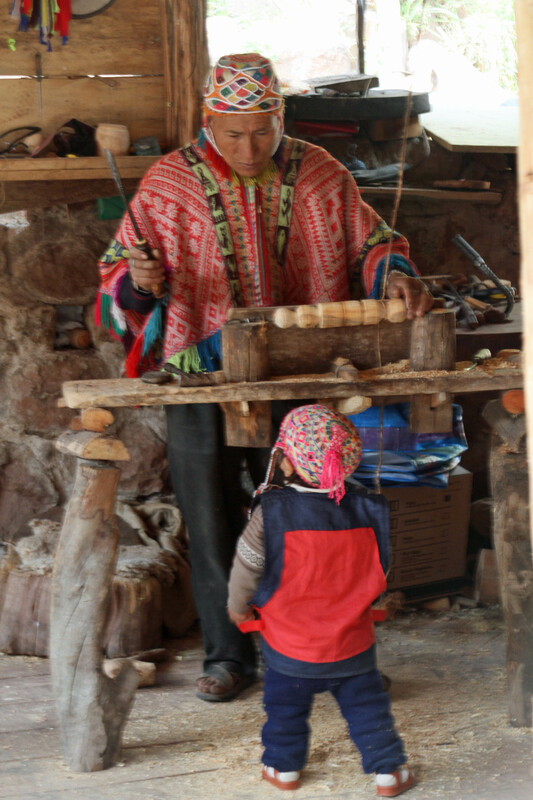 There were also demonstrations by locals who learned the tradition of weaving the wool and making the wonderful cloths they sell today. 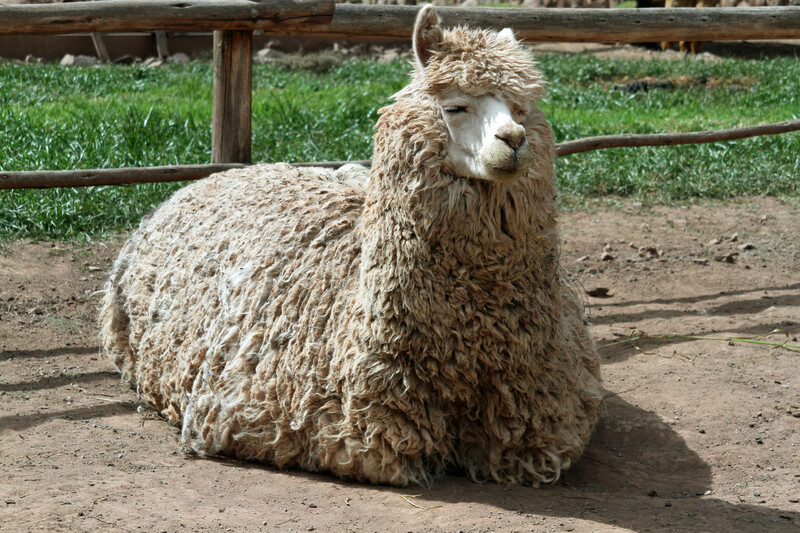 Baby alpaca is the first “shaving” of an animal and is softer, costing more. 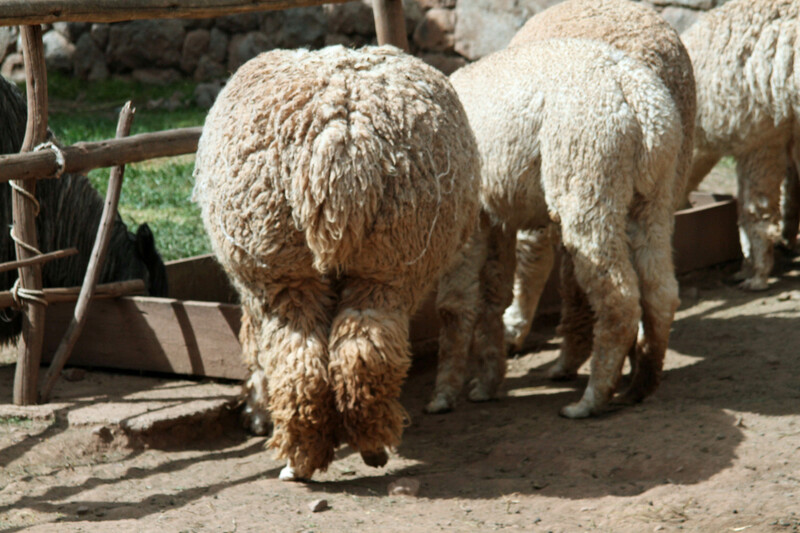 There were several breeds of both kinds of animals and all were fun to and interesting to see. 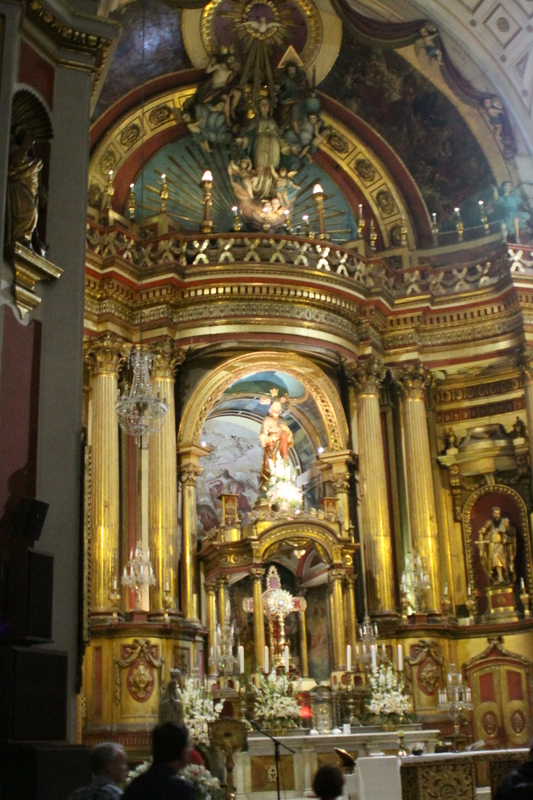 As we went through a beautiful church, we learned how the Peruvians really mixed their pagan traditions with Christianity. There is lots of that all over the world; however, I was somewhat shocked that they didn’t only observe old traditions, they still “worship” pagan symbols. At the risk of sounding judgmental—I’m surprised they can’t see the outright contradiction with the first commandment. 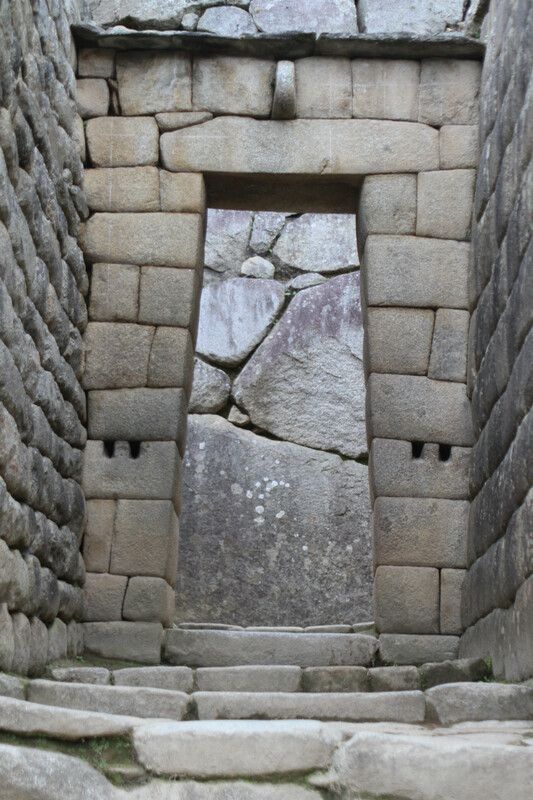 For example, there was a stone from pagan religions that sits in a glass near the door. On Sundays, the people line up after service and put their hands on the stone and pray. The priests say “it’s just a door stop” b ut the people believe it’s more. There are other symbols including statues and paintings depicting Mary in clothes that are like triangles (mountain shaped and hiding her feet)—she symbolizes Mother Earth who they worship. And paintings of her pregnant that contradict the Catholic religion, but not Protestant. 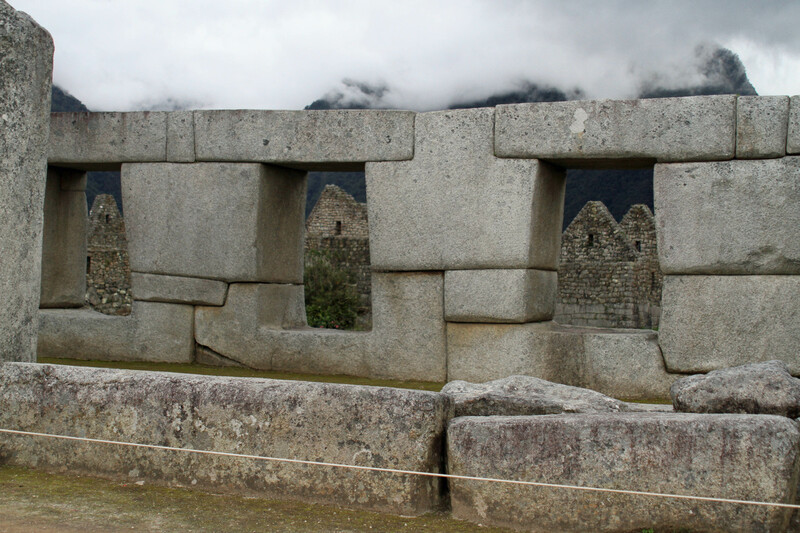 Throughout the trip we were told of many other pagan worship rituals that still happen. While a little disconcerting, it was a good lesson of their culture and I found their architecture and people to be quite beautiful. Dad and I did our traditional shopping trip around town and then went back to rest before dinner and another very early morning wake up to catch the flight to Lima and then on to Guayaquil, Ecuador. 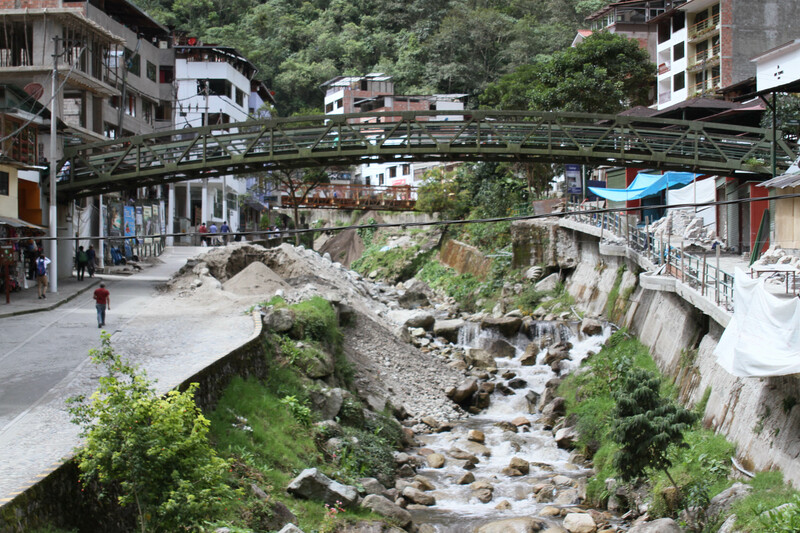 We landed in Ecuador and took a short city bus tour. Our hotel rooms were big and we explored the main street around us—not really finding anything but banks, disease-welcoming restaurants, tiny mini markets, pharmacies, etc. 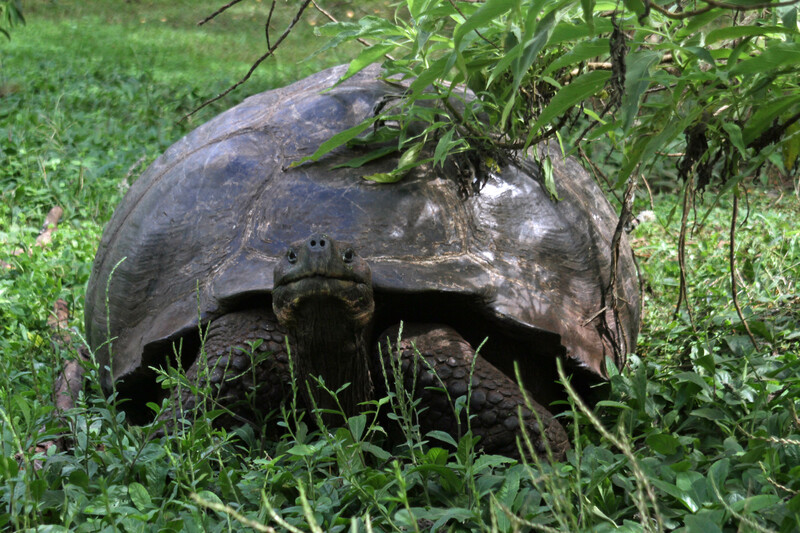 Our next morning was brutally early and back again to the airport to catch a flight to San Christobal in the Galapagos. Goodbye beautiful Peru and more on the islands to come! Winner winner, Guinea Pig on a stick dinner. 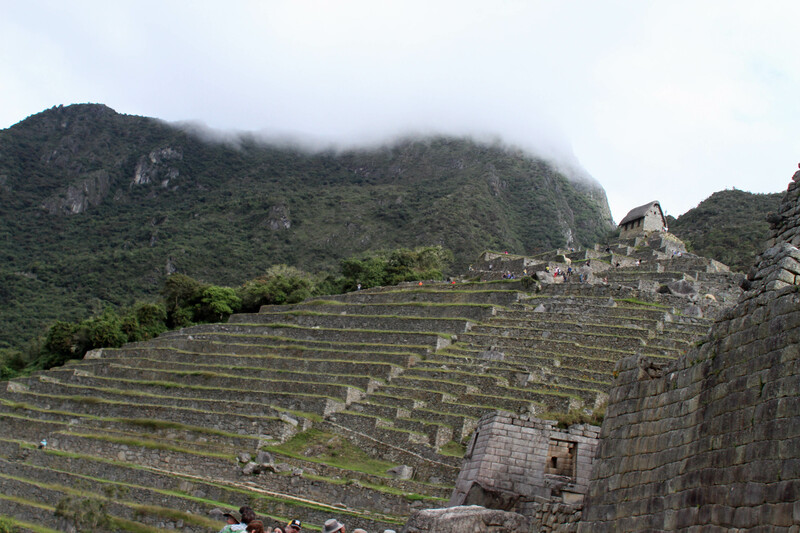 Our Peru adventure continued with a very early flight to Cusco. At an elevation of 11,100 feet, the flight in was a bit scary. I could only see high snow-capped mountain tops out the window, which was disconcerting as we heard the sound of the wheels being lowered, meaning landing was imminent. A very steep banking curve brought us down to a strip that was completely surrounded by buildings. I was thankful when the plane came close to the end of the runway that there was a church there to break our stop if need be. 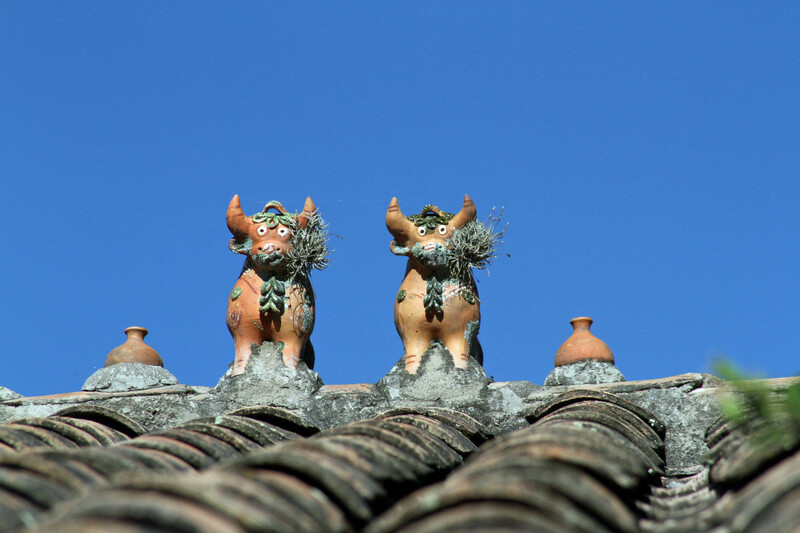 Bulls on the roof are a symbol of prosperity. 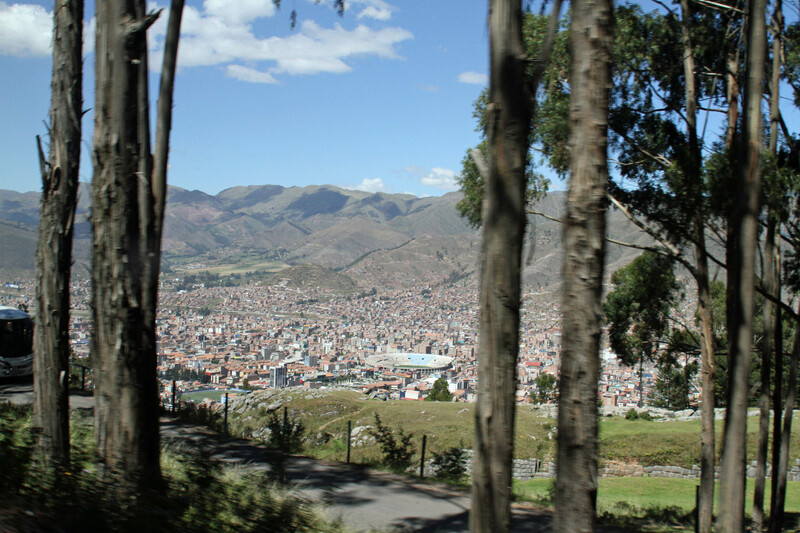 For the first few moments off the plane I felt really dizzy, but was able to adapt to the elevation a little bit better during the bus ride through a town crowded with houses half done and lots of wires between leaning telephone poles. 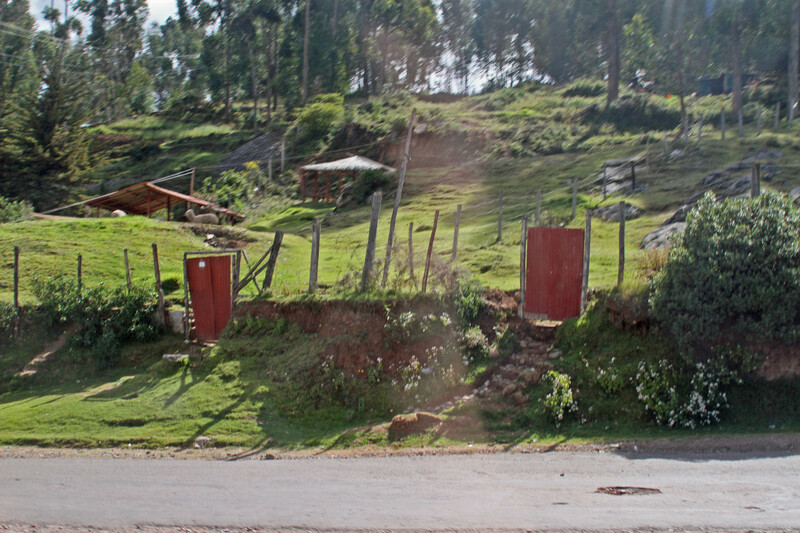 On our way up and out of town, we passed homes that had two small bulls and a cross on the roof. Evidently that is a symbol of prosperity. Many people take years to finish their houses. For one thing, they save up bit by bit for the parts and construct it over time. Also, once the house is done, they have to pay taxes, so there is little rush. They typically leave some rebars up to make new levels for kids when they grow up. 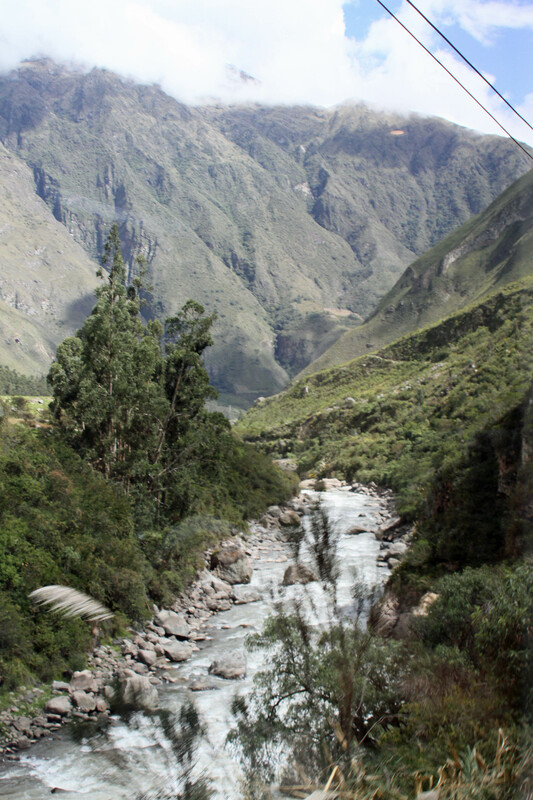 Our guides explained the culture a bit as we rode through the Sacred Valley. 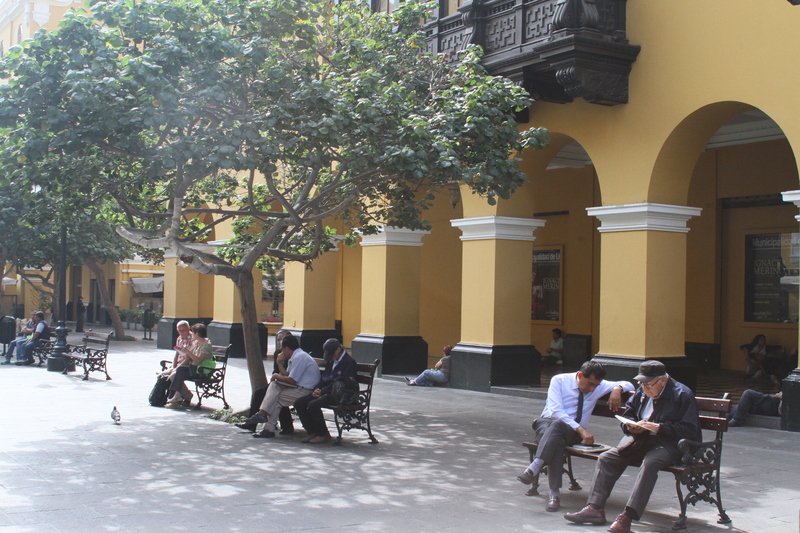 Peruvians have public schools but only some are lucky to attend the private schools that go all day. Others can only go half days—they accommodate everyone by having two shifts in the am and pm. Some of the universities are public but there aren’t a lot of openings. 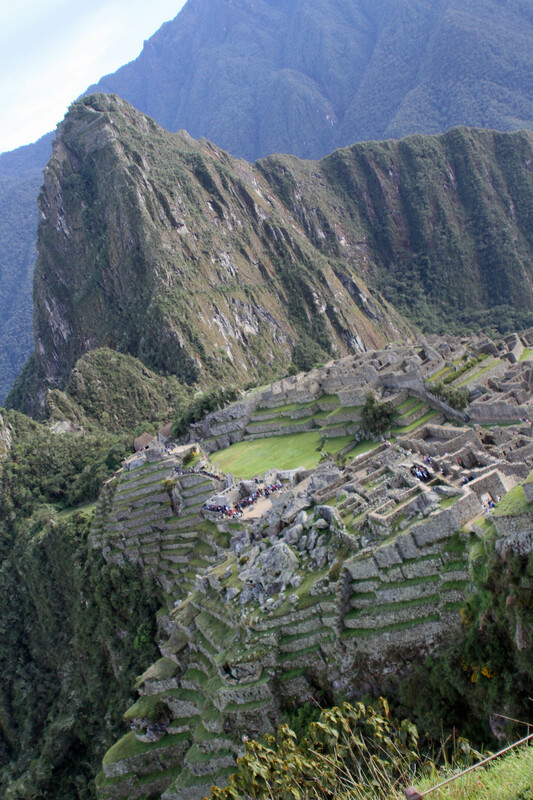 I always think of the USA as the melting pot, but all over the Americas we can see diverse populations and Peru is no exception. 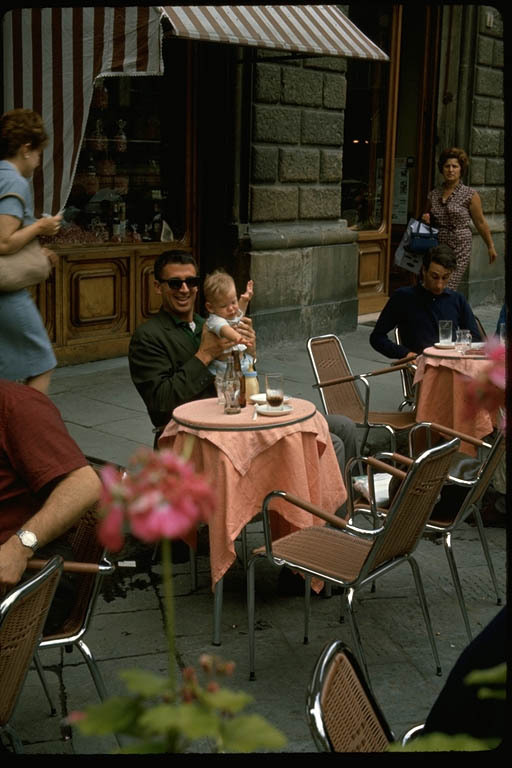 The original habitants have mixed with Spanish, African, Asians, Italians, and more. 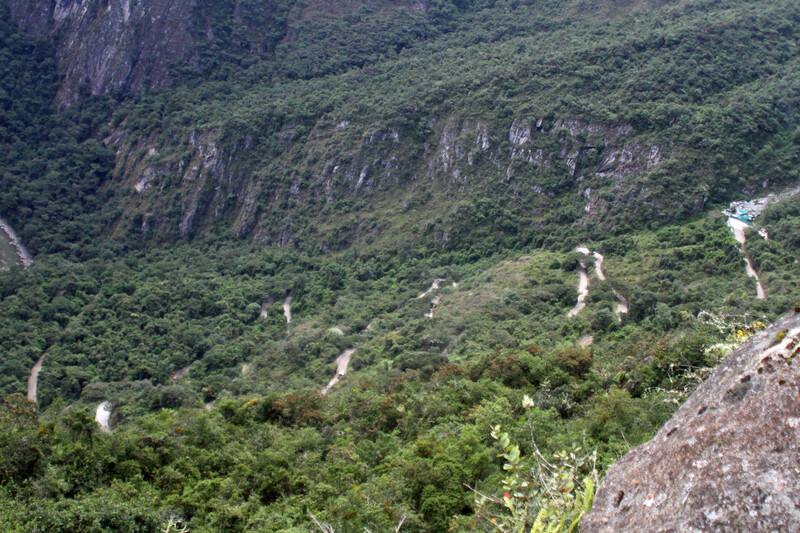 Evidence of the vast agriculture can be seen all over the mountains. 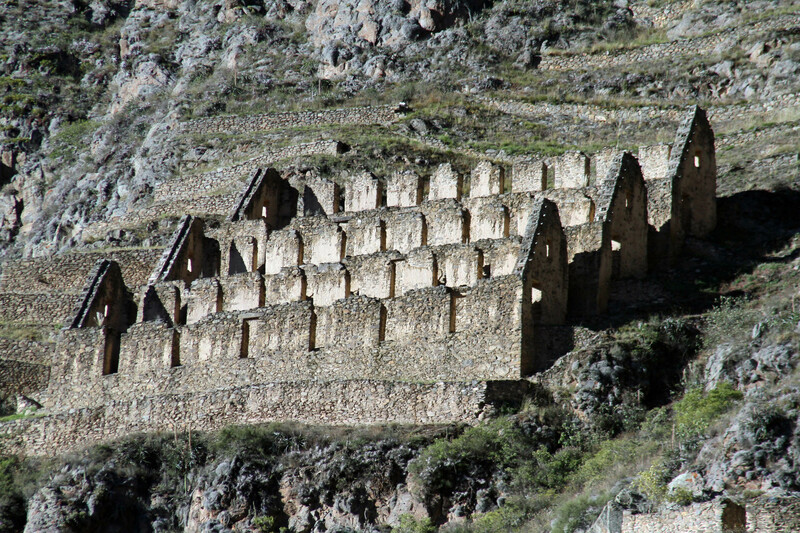 The Incas built terraces everywhere and stored up years’ worth of food in storehouses. 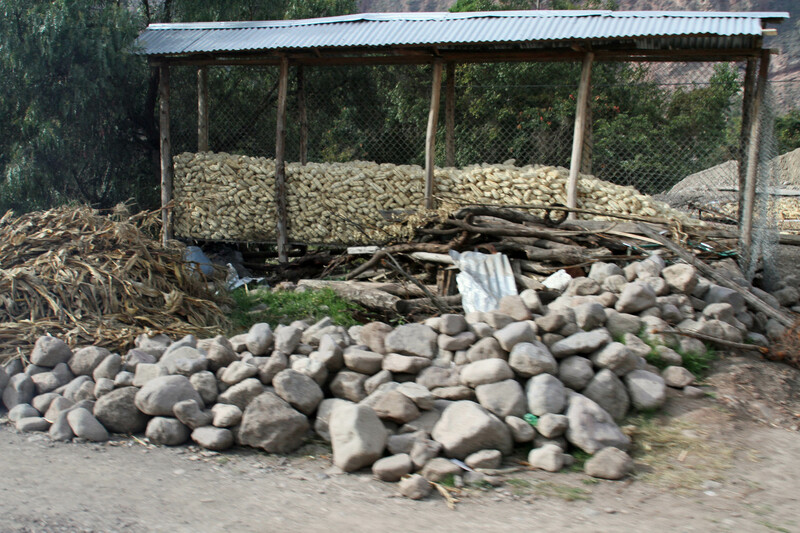 There were ancient potatoes recently dug up that when treated and cooked were still edible. 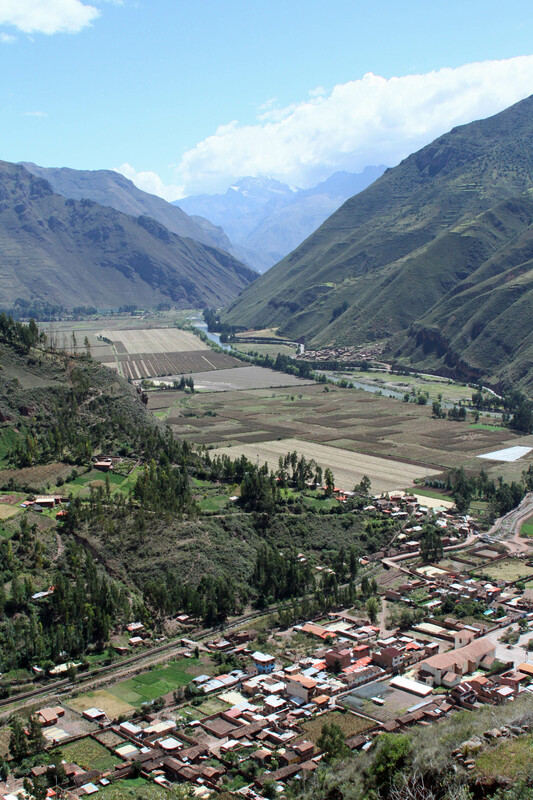 Some terraces are still in use as the Peruvians cultivate about 4,000 varieties of potatoes. The soil there is so varied and in fact some is similar to what is on Mars so they are doing some agricultural testing for the Mars missions. Guinea Pig on a stick. 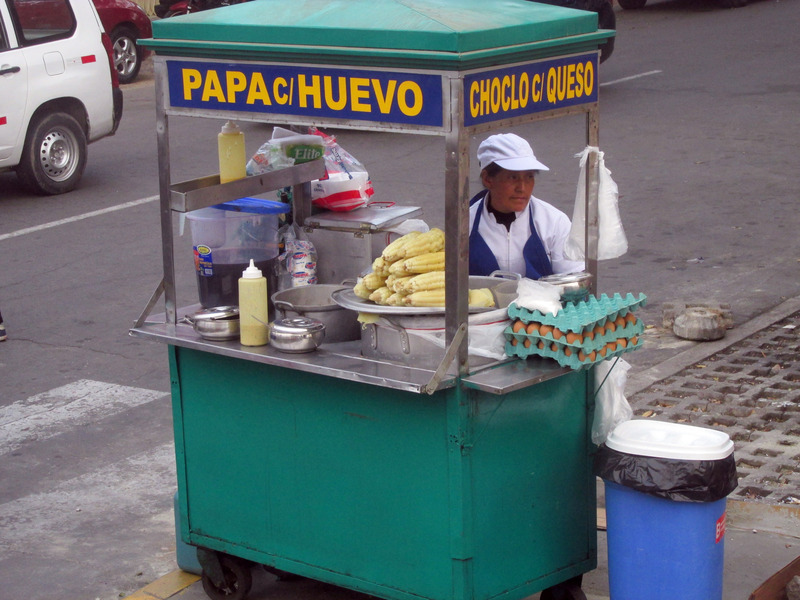 Some of the sights along the road through the small towns included rainbow flags—the ancients were rainbow worshippers, red flags on poles outside of some homes—which was a sign that they served Chicha or Corn Beer there, and painted advertisements on homes. The ads were mostly political signs for the recent elections. The people would consent to the painted signs because basically they needed their houses painted and could get it done for free. In random places on the road and on small fields, people were drying corn on blankets and they would store lots of corn cobs in chicken wire bins. One town was famous for its Guinea Pigs. 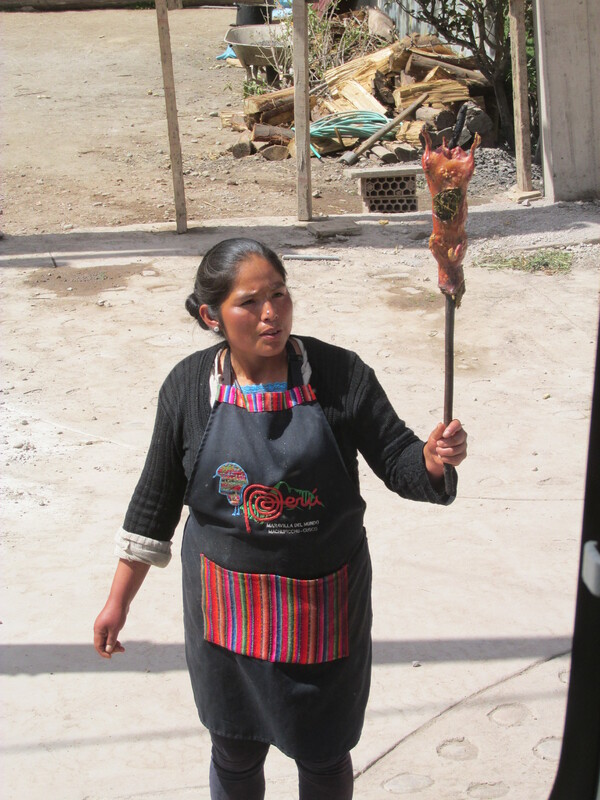 In many homes in Peru, they have a dozen or so pigs living in the house (which is usually just one stone room) and when dinner time comes, they pick the fattest one and cook it up. 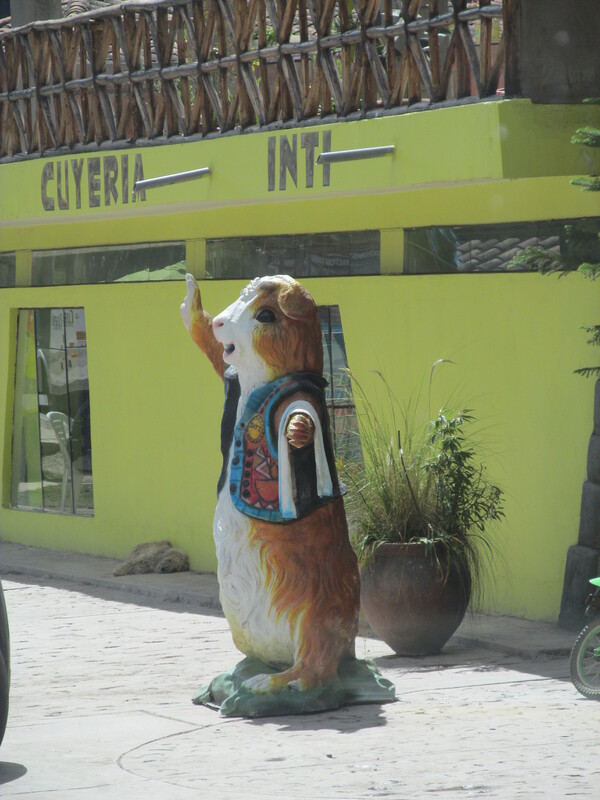 As we went through this town, outside a restaurant with Guinea Pig on the menu, there was a 6-ft. plastic statue of a pig and a woman holding a roasted Guinea Pig on a stick. 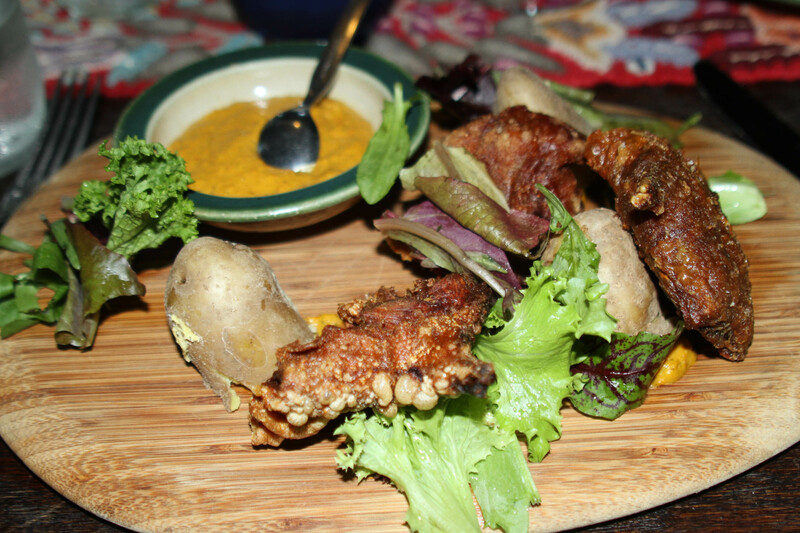 I tried fried Guinea Pig at dinner that night. The closest I can describe it, would be like duck. It wasn’t too bad. 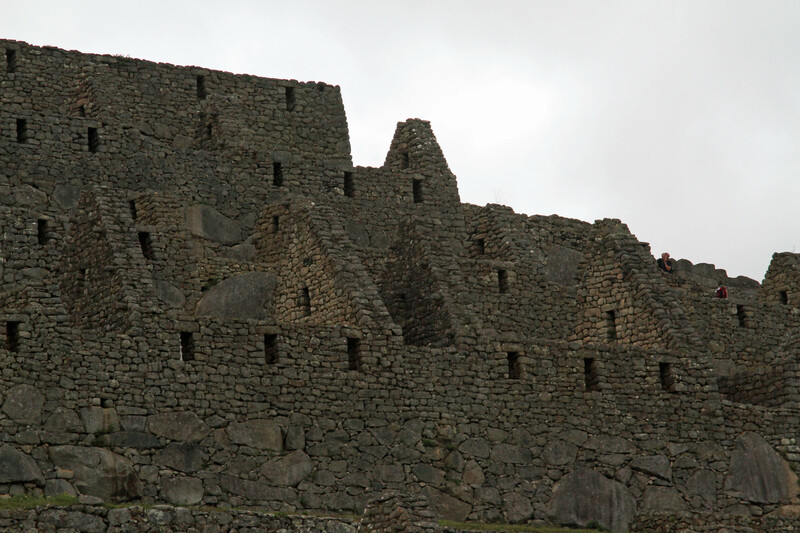 Mom and I went on a tour to Ollantaytambo, a village near our hotel that was once the site of an Incan emperor and a stronghold for the Incas who were fighting during the Spanish conquest. As we started the tour, Mom got hurt on a step and cut her leg. Not to downplay her pain, but it was just a cut and the reaction from our group and the town officials, which was very kind and caring, was on par with a five car pile-up. Some police showed up and wanted to whisk her away to a local medical hospital of sorts. I thought maybe a bandage and some rest would be fine, so she hung out at a café and people-watched while we took a short tour. 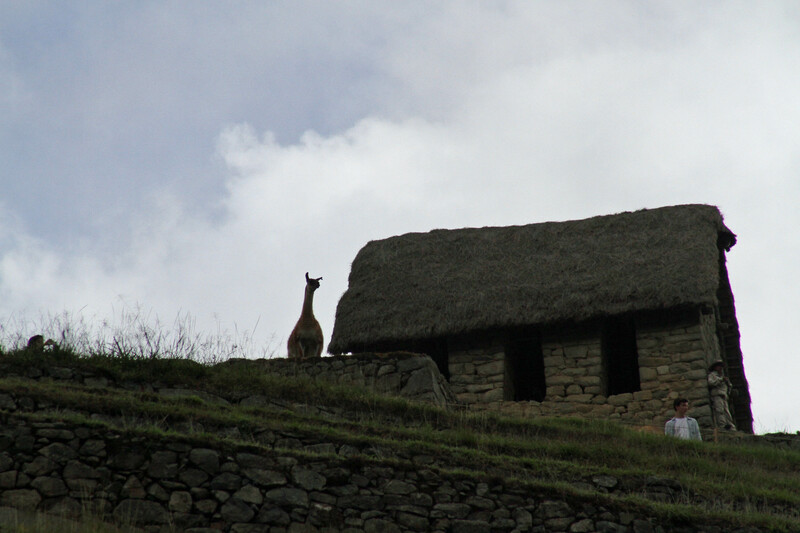 We saw how buildings had Incan foundations and doors, Spanish walls, and then modern materials toward the tops of the homes. The next day we all came back for a tour of the ruins. 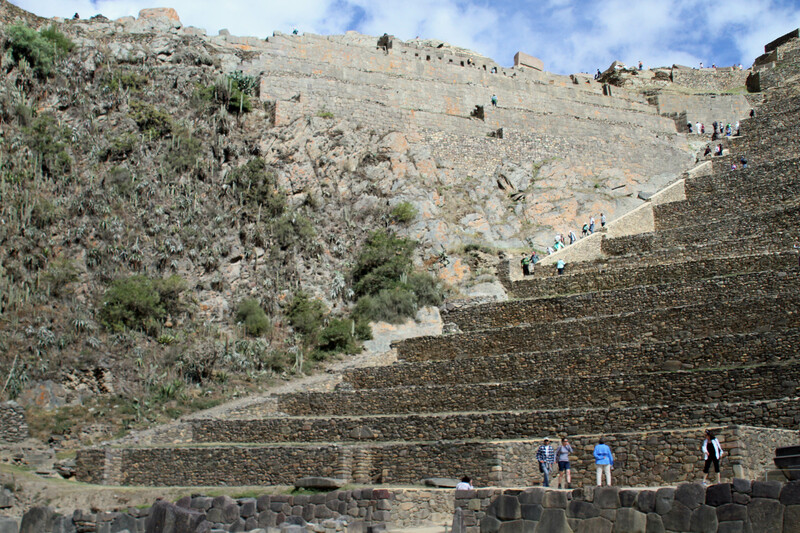 The sun temple at Ollantaytambo. 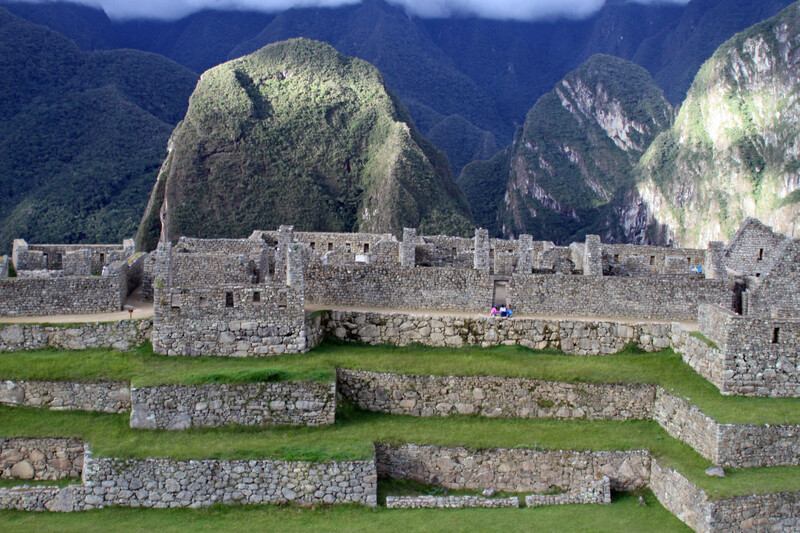 The Incas built their sun temples high up on the hillsides. 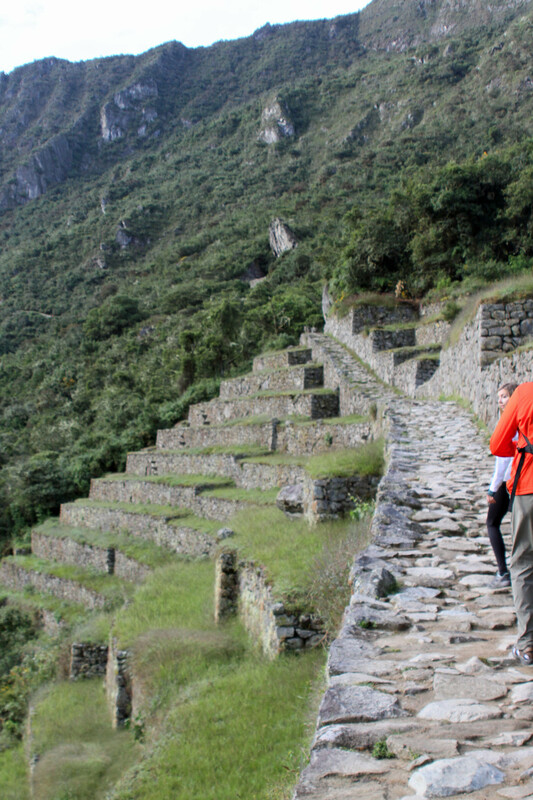 We took a long steep climb up the ancient stairs with lots of breathing breaks. 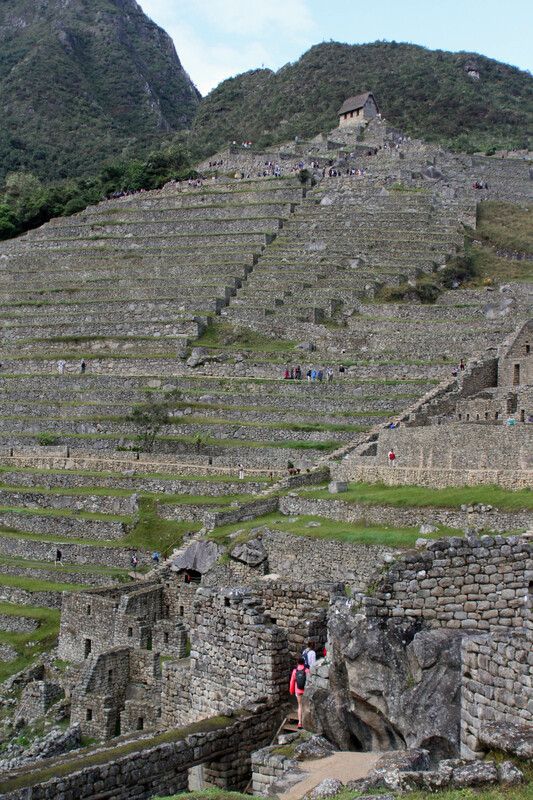 The ruins were impressive as somehow they managed to get 50 ton boulders set in place with ancient earthquake-resistant building techniques. 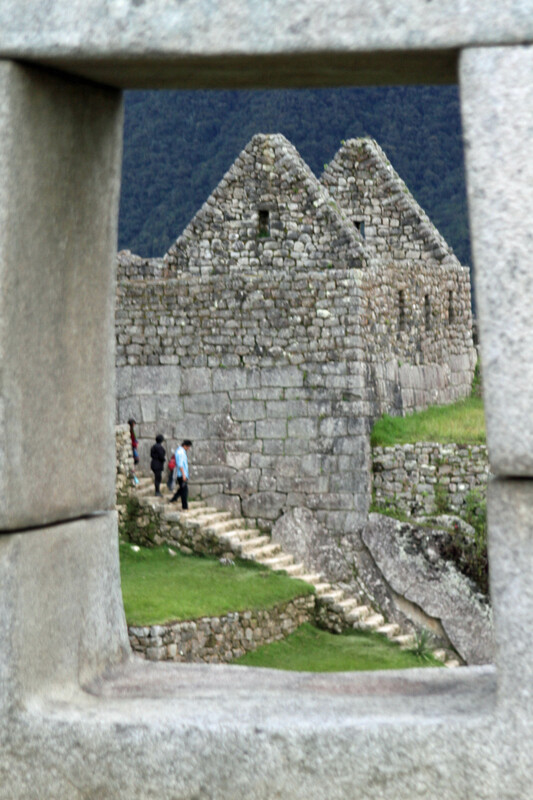 When the Christian Spaniards came, they made the locals toss some of the big boulders of the temple down the mountain and when they told the Incas to build a church there they said, “You should have told us that before the boulders were tossed.” So the church was built in the valley. 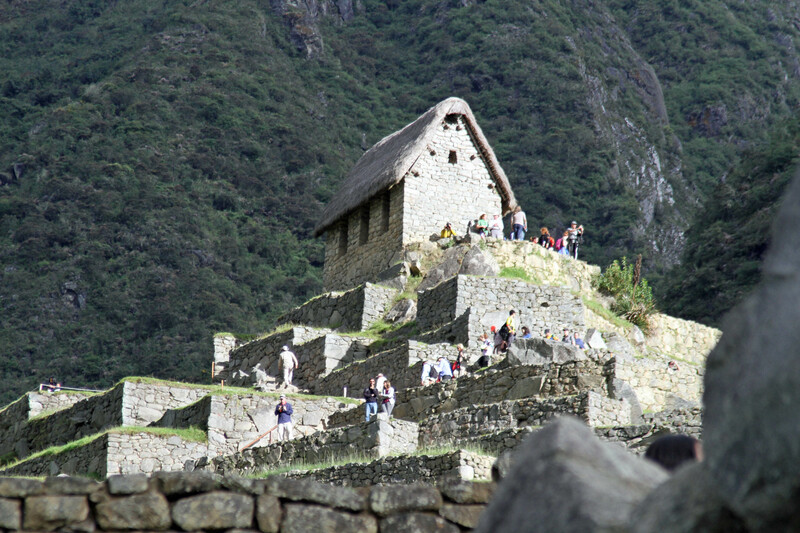 The Incas had built their temples every 20 miles or so and once had a pyramid there that was bigger than the ones in Egypt. 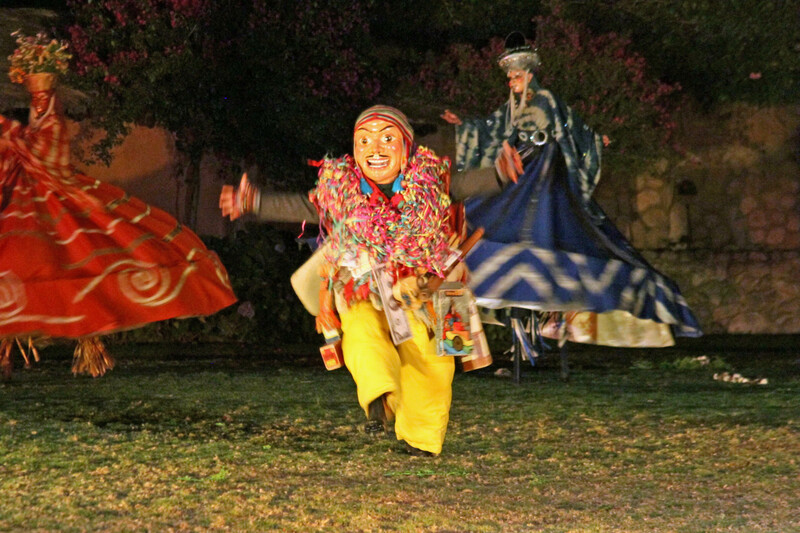 We ended the day with an interesting exhibition of dancing and storytelling. 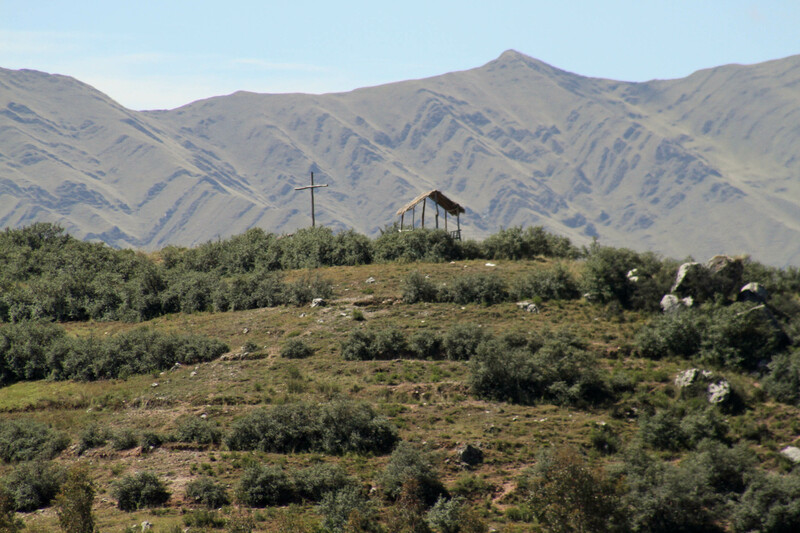 Peruvians tend to mix their Christianity with ancient pagan religions. One of the things we saw in the house and was also part of story/dance was this strange looking guy called an Ekeko which is the mythological god of abundance and prosperity. 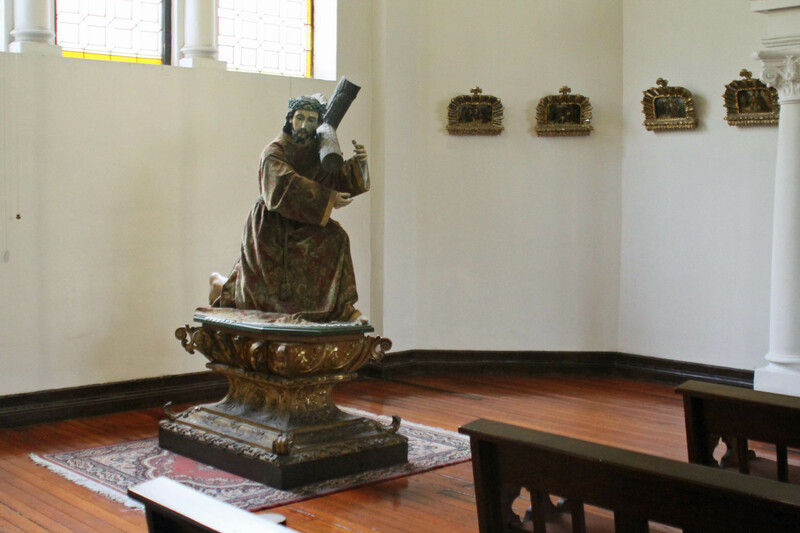 The people would place the statue in a prominent and comfortable place in the home and load it up with things like money and other symbols of what a person desires. These offerings are meant to bring wealth to the worshippers. 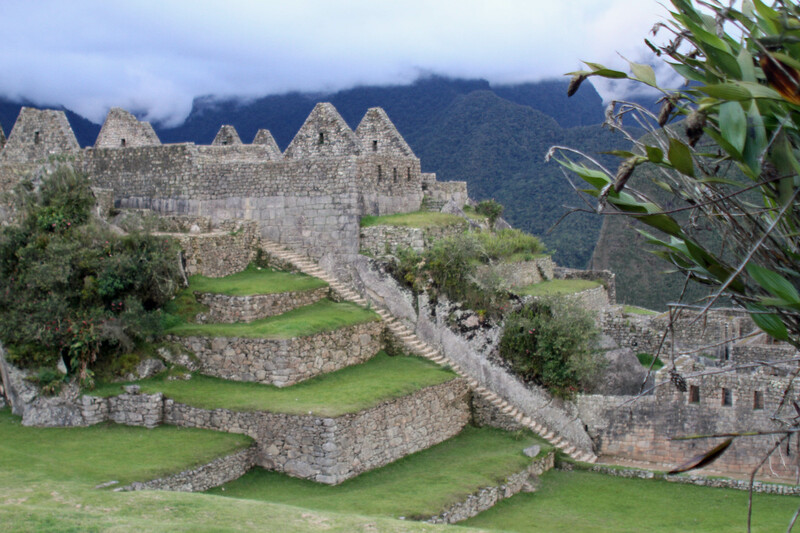 More about the deep rooted mixture of ancient pagan religions and Christian worship later after we return to Cusco from Machu Picchu! 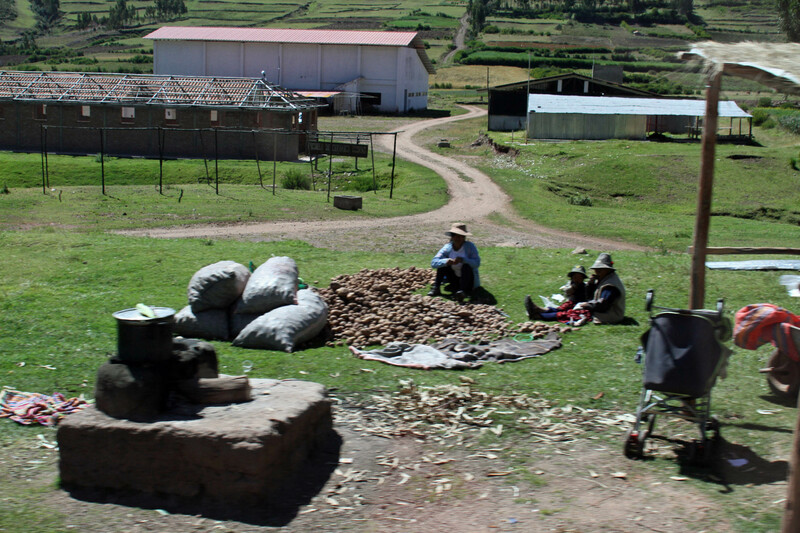 Locals drying corn and potatoes. 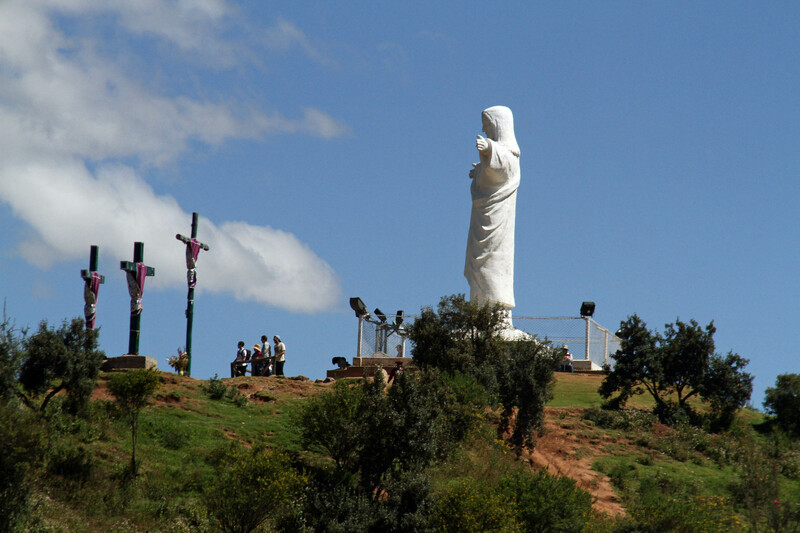 Large Christ statue outside Cusco. 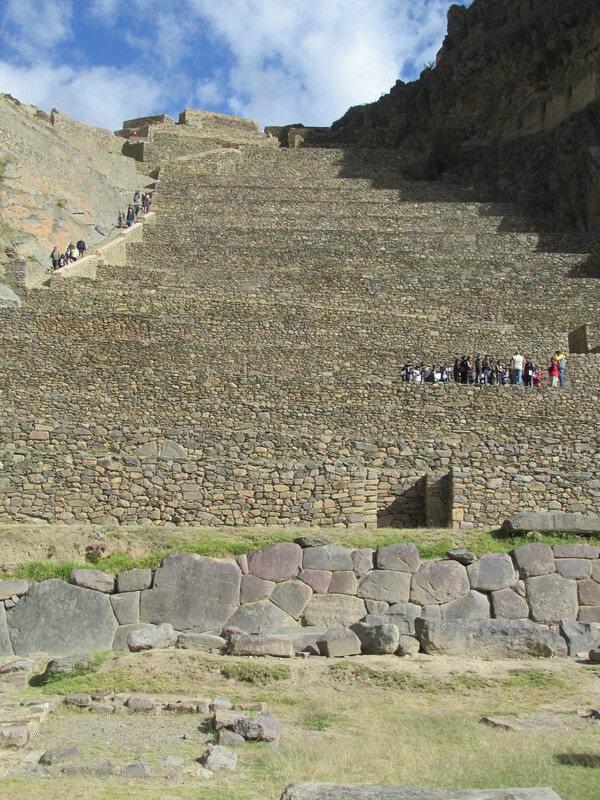 Looking down the terraces at Ollantaytambo. 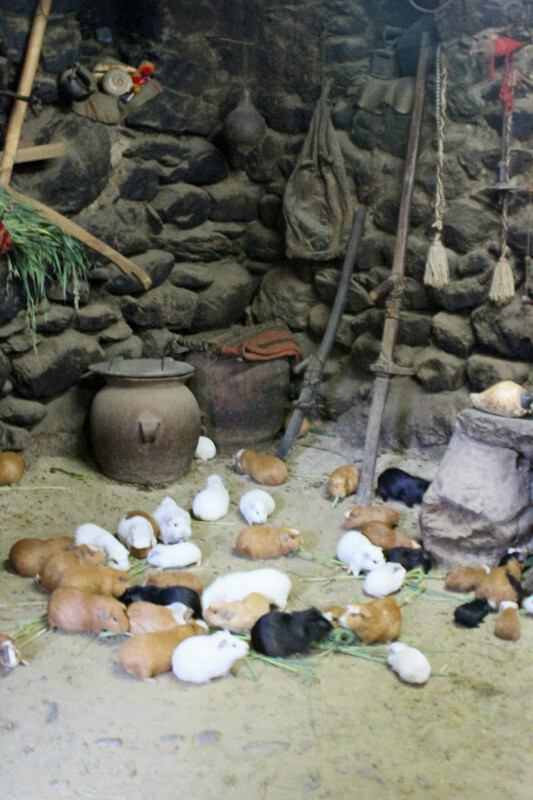 Guinea Pigs live in a local home. 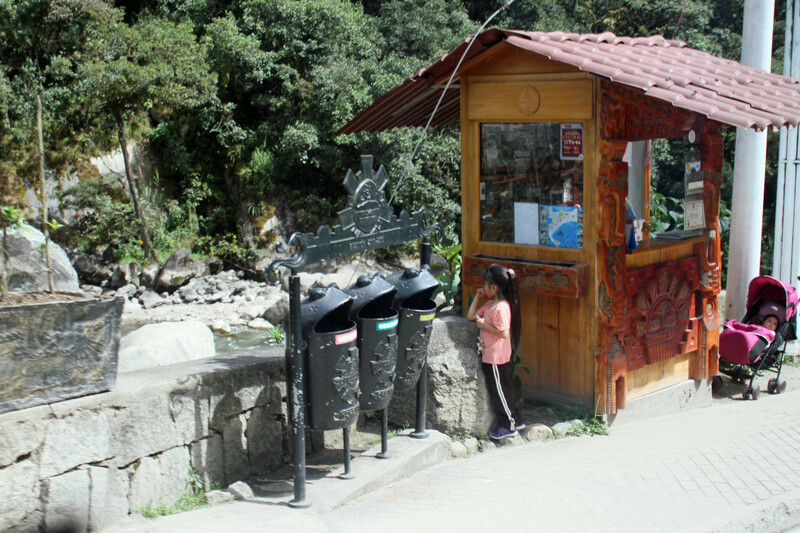 A street in Ollantaytambo with a channel of water running in front of some homes. 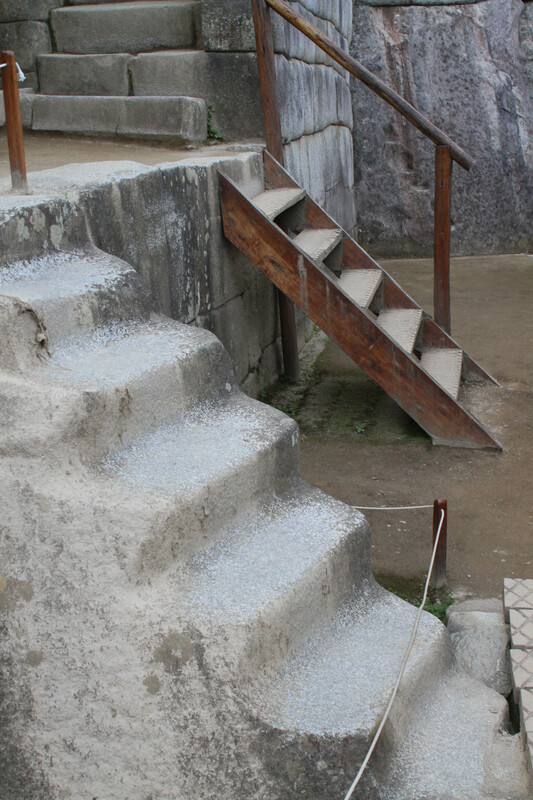 Stone steps act as mini bridges. 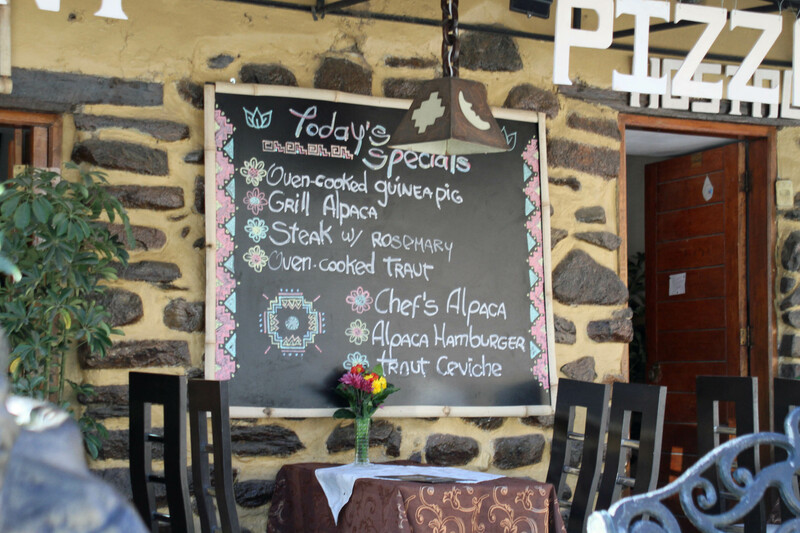 Menu highlights Guinea Pig and Alpaca which tastes like steak. Siesta time on a local farm. Guinea Pig is on the menu here. 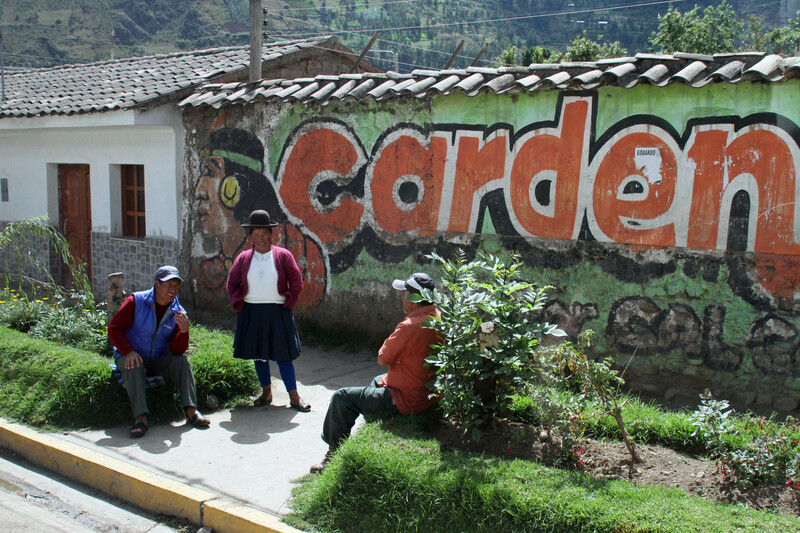 Locals hanging out in front of a house painted with a political advertisement. 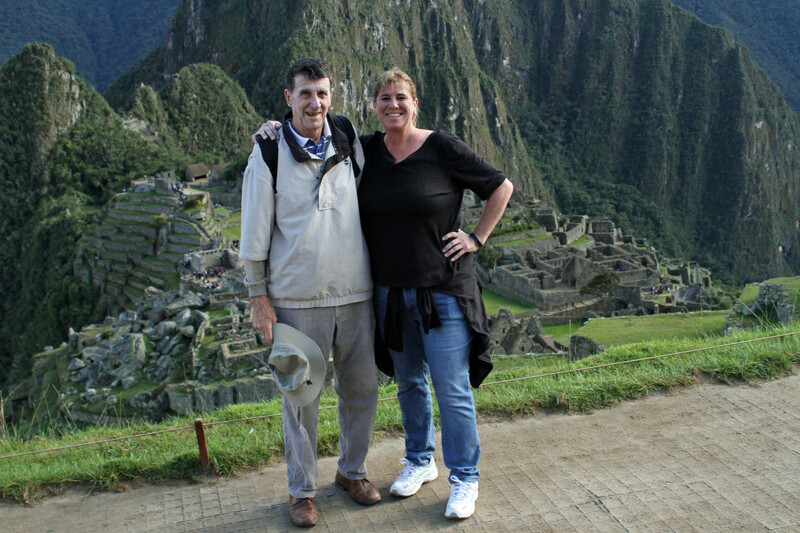 The great Peruvian and Galapagos adventure begins. 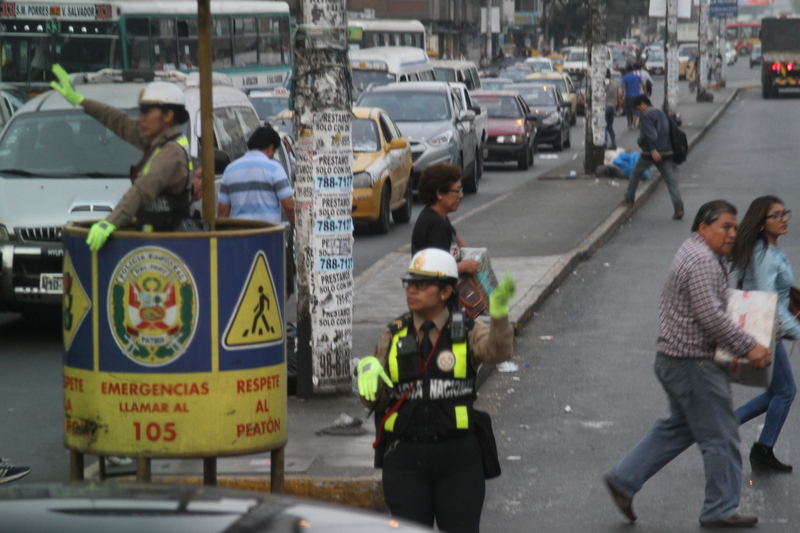 Female police officers keep things moving at rush hour. 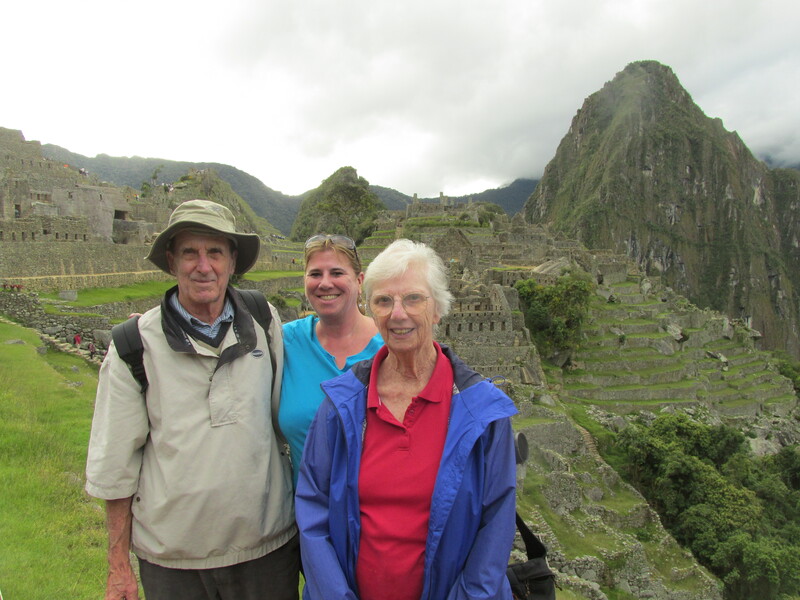 The Crowe family adventures continued in 2017 to a long-awaited (three years in the making) trip to Peru and Ecuador. Initial thoughts are it was beautiful, fun, interesting, exhausting, and worth the wait. I’ve never taken a Spanish course but found that all the Spanish we see in the States gave me enough to work with when needed. However, as usual, many people in the world know English at least a little. So, day one we arrive after a very nice comfy flight into Lima. In the morning we grabbed a 30-minute cab ride into the center of town. It cost the three of us a whopping $6. 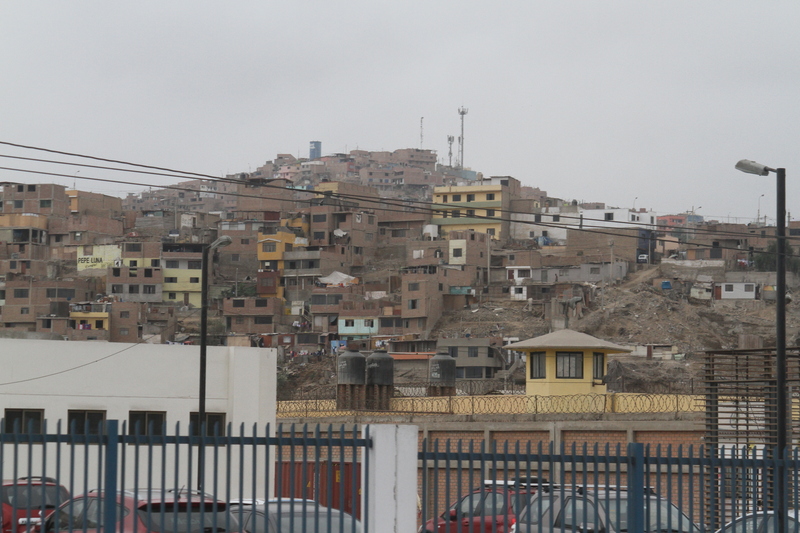 I can only explain driving in Lima as a ride on the Tower of Terror. I was upfront for the action and took it on faith alone that we would arrive alive at our destination. Lane lines are merely suggestions and spaces between cars are measured in millimeters. Cars without dents are non-existent and cabbies have mad reflex skills. Good brakes and a horn are necessities. Also, the intersections were managed by female police officers. Evidently the ladies were less prone to corruption and don’t take crap from anyone, making them perfect for the job. 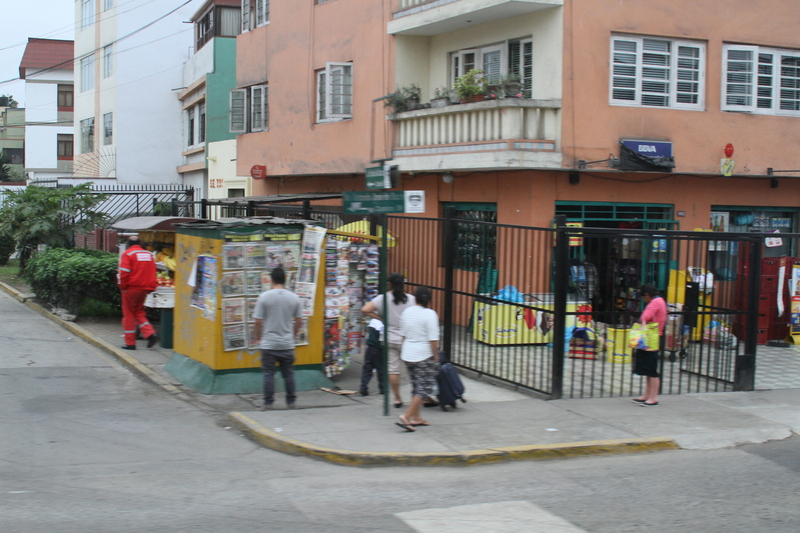 There is no metro in Lima—politics and infrastructure make it an impossibility. 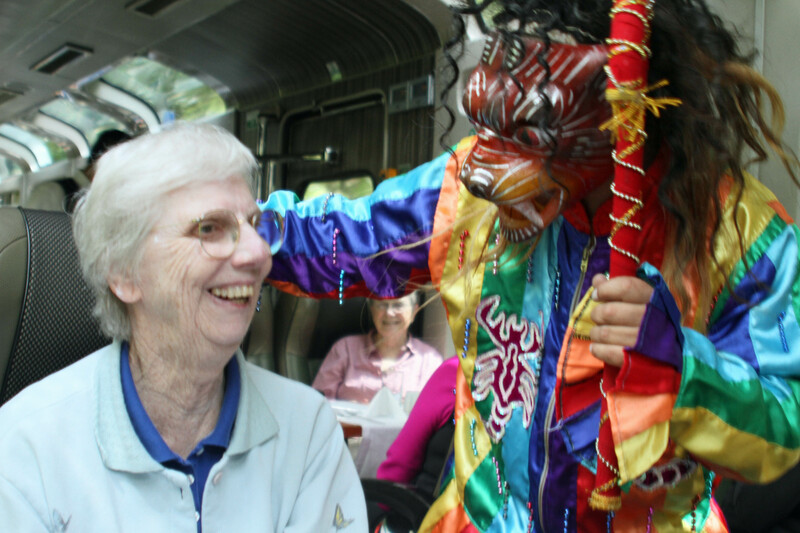 There are a lot of private busses and here’s the fun way it works. As the bus runs down the road, a guy on said bus yells out where he’s going and solicits prospective riders standing on the curbs. Then they pack the busses to the gills. They also have Uber there; however the low-cost cab ride didn’t incentivize me to look elsewhere for savings. After touring through a cathedral and the central square, we visited the St. Franciscan Monastery and Catacombs. Since so many people needed to be buried in the limited consecrated ground (that they conveniently paid for), they would throw the bones from the older burials into pits to make room for new burials (we saw a lot of those bones and some mummies). There were hundreds of old/ancient books in the library. To our surprise they were left out in the open, unprotected to the elements. 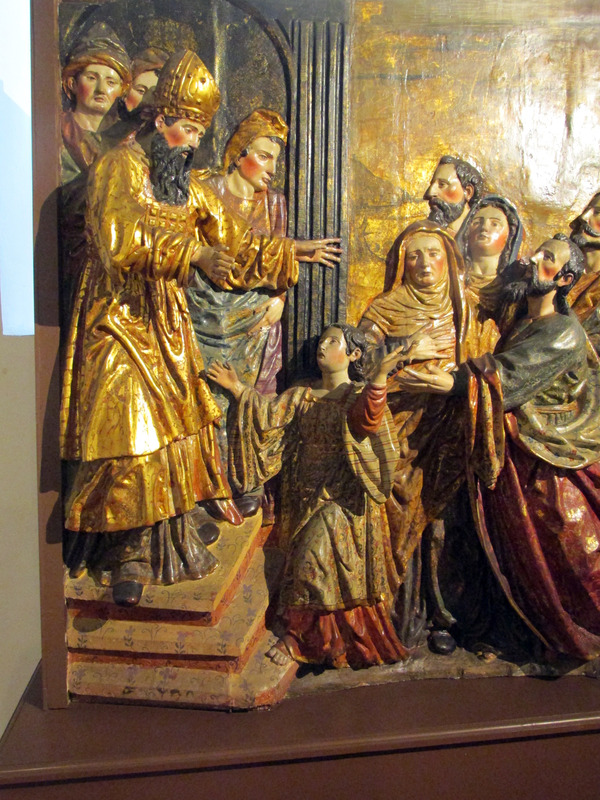 It was a beautiful place with hidden paintings under plaster and complex baroque-style artifacts. For lunch, we walked around and found a Peruvian/Chinese place which we later discovered was very popular in Peru. 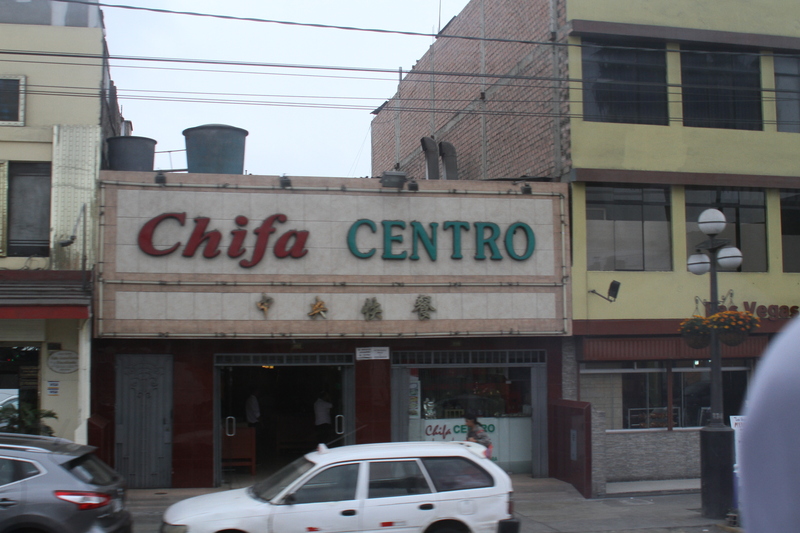 A lot of Chinese immigrants had arrived there in the past and they would call people over to “come eat rice.” The Peruvians couldn’t understand them, they just heard the word “chifa” so the Chinese restaurants are now all called Chifa. We had potato/egg-like tortillas with chicken and meat. It was pretty good. 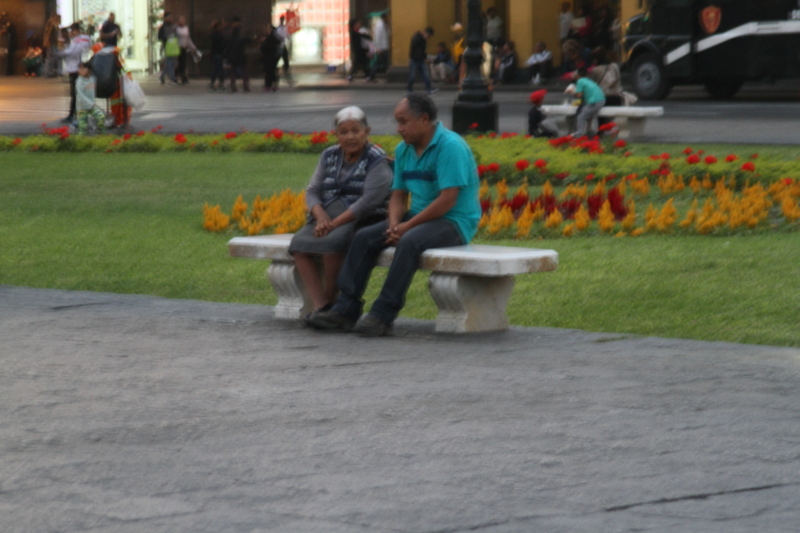 As we walked around the square, we saw a small protest going on. A number of police in their riot gear were there but it was peaceful and we saw them shaking hands with the protestors after. Evidently there is a lot of corruption going on with business and government leaders. Sounds familiar. 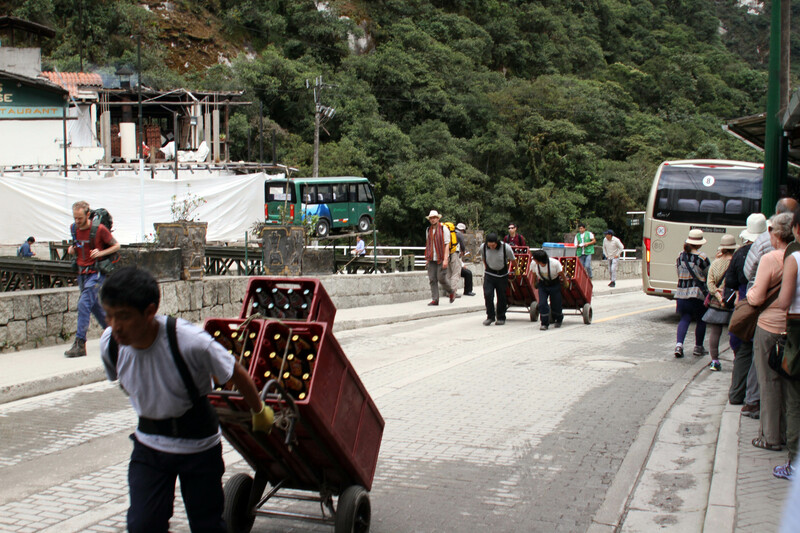 We bought a few items from the locals and managed to negotiate a cab ride back to the hotel. The next day we started bright and early with a group tour to an interesting museum. 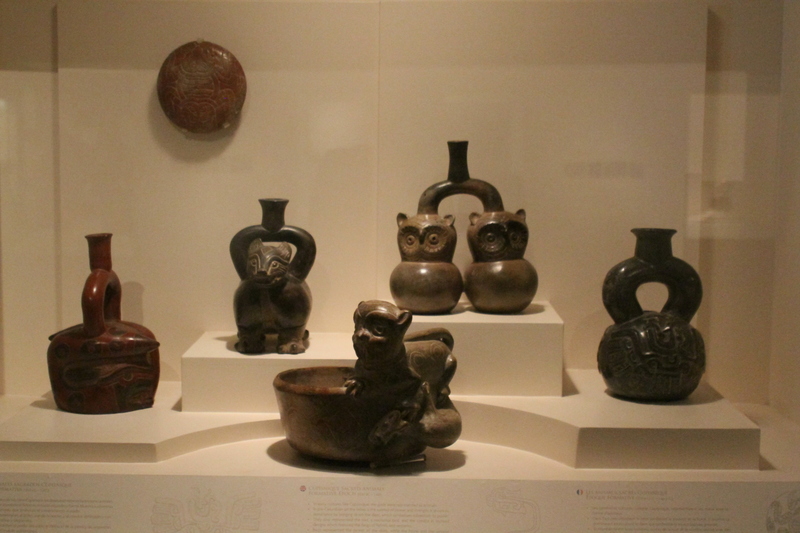 Some of the 45,000 artifacts at the Museo Larco. 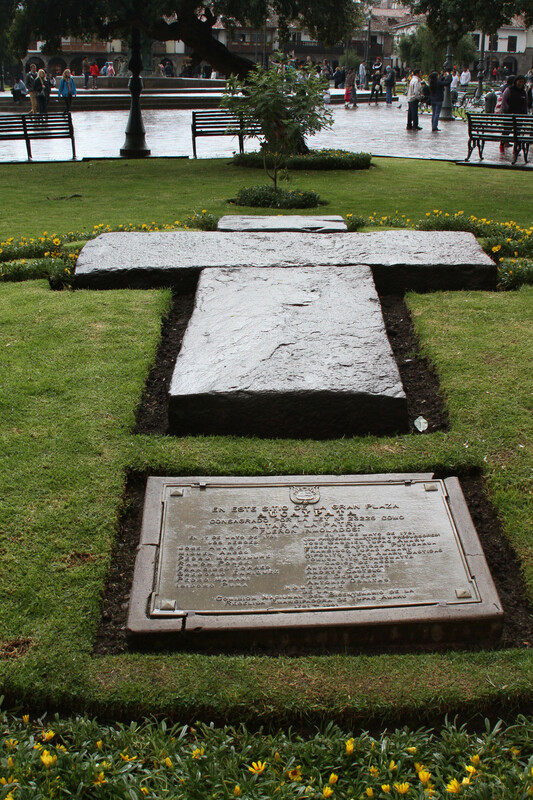 The Museo Larco has 45,000 artifacts, dug up on an estate nearby by a private family. The objects were all from graves—funerary items to help the dead with all they need in the afterlife. 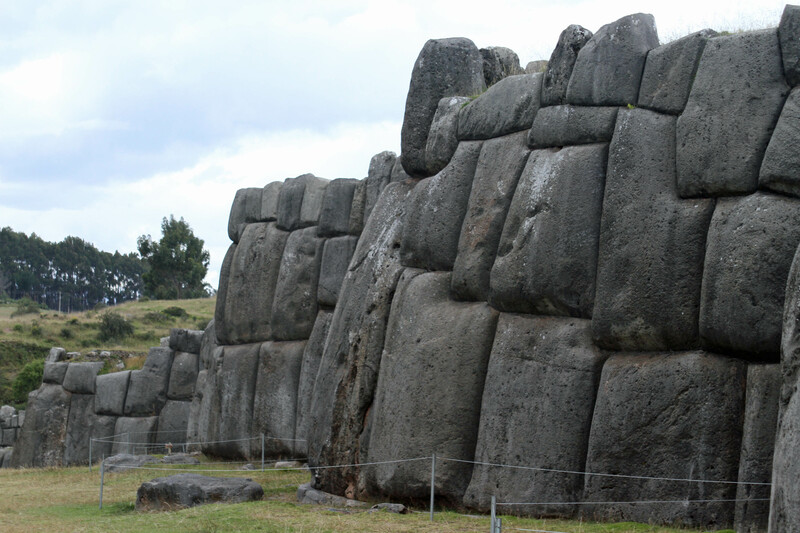 They were a pretty advanced civilization and had beautiful pottery, textiles, and jewelry. For lunch we went to a hacienda where they bred Spanish horses. We saw a little show and some dancing. 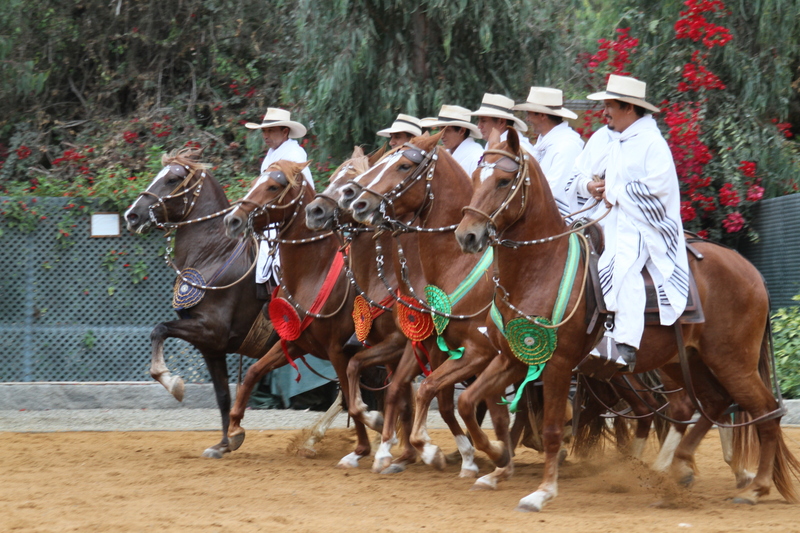 The horses have a special gait—only one hoof touches the ground at a time. I got a little “pony ride” and then went on to have some pisco sours and munch on the buffet. I also tried Inca Cola, a yummy yellow soda and some Peruvian food, which is delicious. 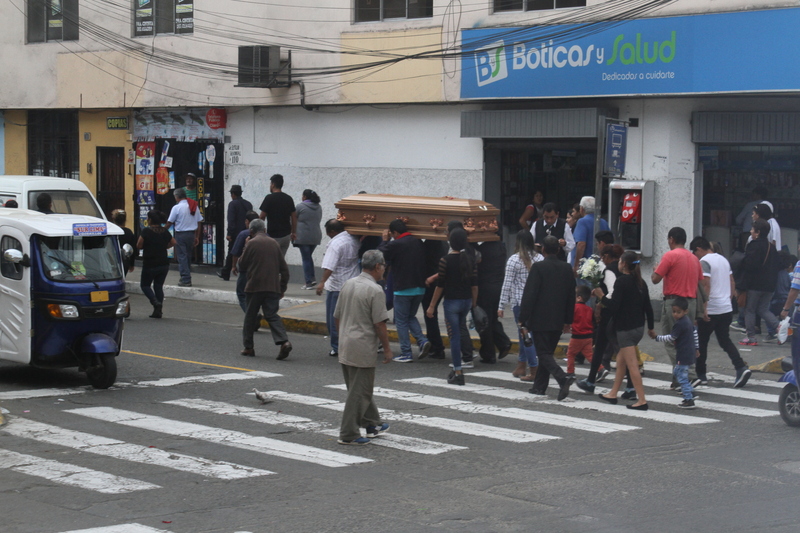 A coffin carried through the streets of Lima. 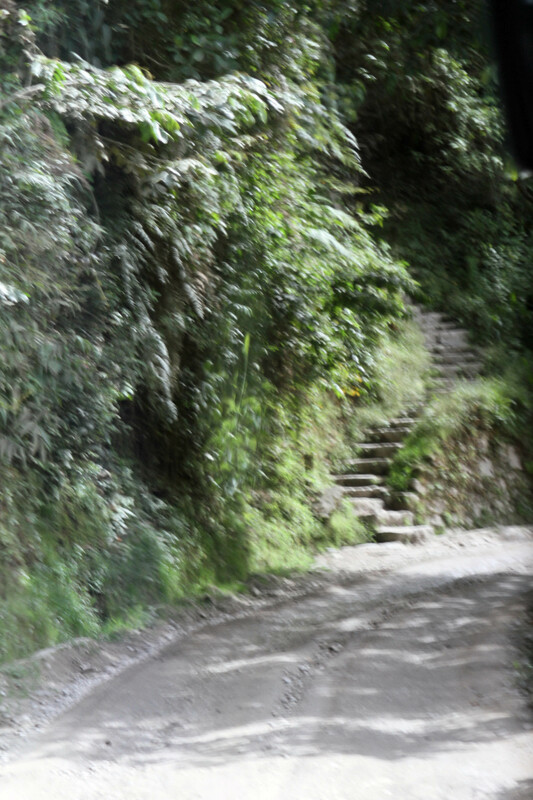 Some sights we saw on our ride included communities that formed by squatters. 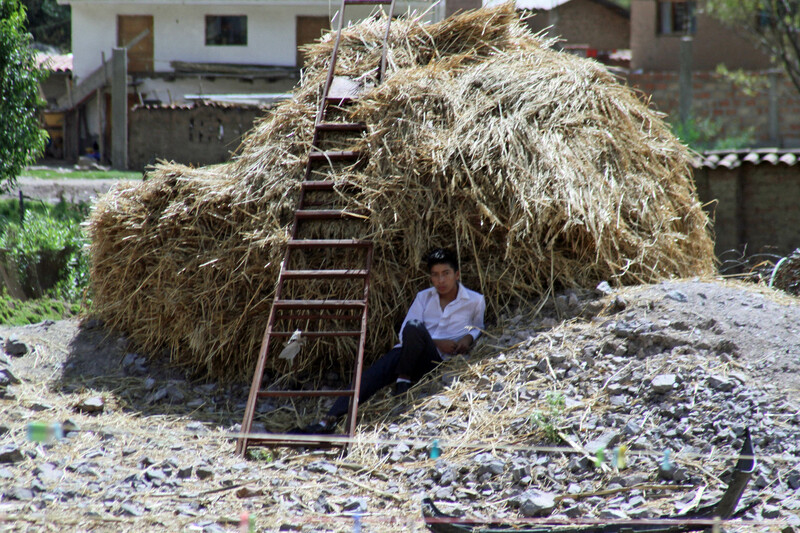 In Peru, you can build a house on an empty lot (some of them had foundations built on old tires) and if no one tells you to leave after a few years (5 or 10), then you are good to go. After a while, neighbors form official communities. We laughed at a casino with a name that translated to “coin swallower.” And we also saw a coffin carried through a street, a couple of prisons right in the middle of the city, lots of car repair shops, and a lot of street entrepreneurs selling water, juice, and an assortment of crap to pedestrians and people in cars. Dinner at one of the oldest homes in Lima. 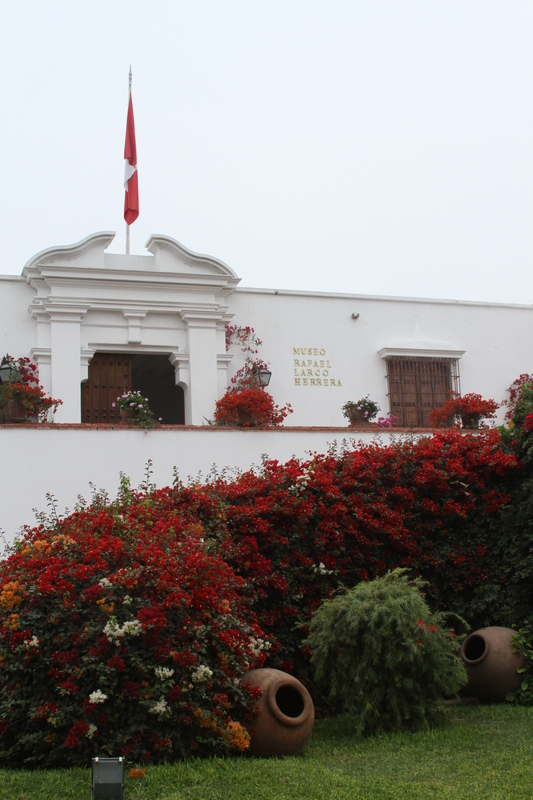 After a tour through a gorgeous church and a walk through the town, we made our way to a one of the first homes built in Lima back in the 1500s. Descendants of the original family still own the home and it’s right next to the Governor’s Palace. The beautiful woodwork, very old furniture, and an open ceiling with a tree in the courtyard, were our backdrop for dinner. 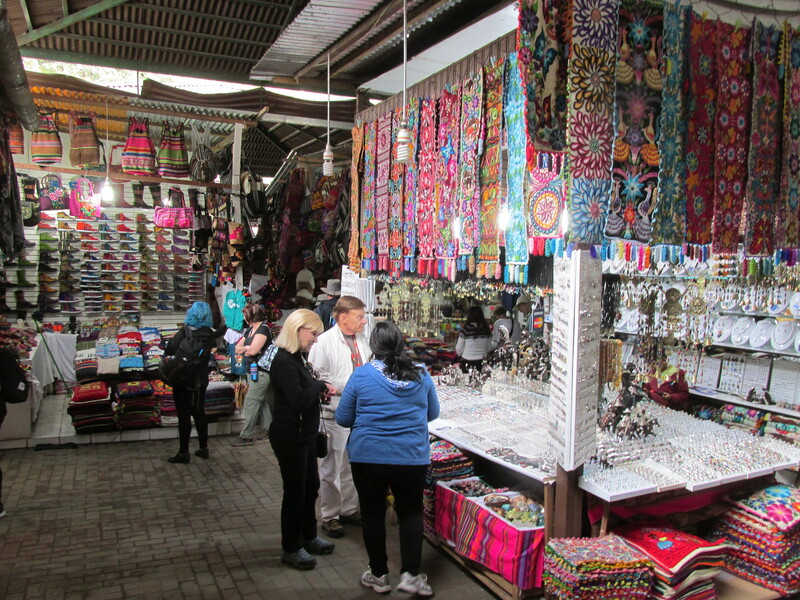 Our group heard a talk from a British ex patriot and a local Peruvian woman about their life and the local culture. 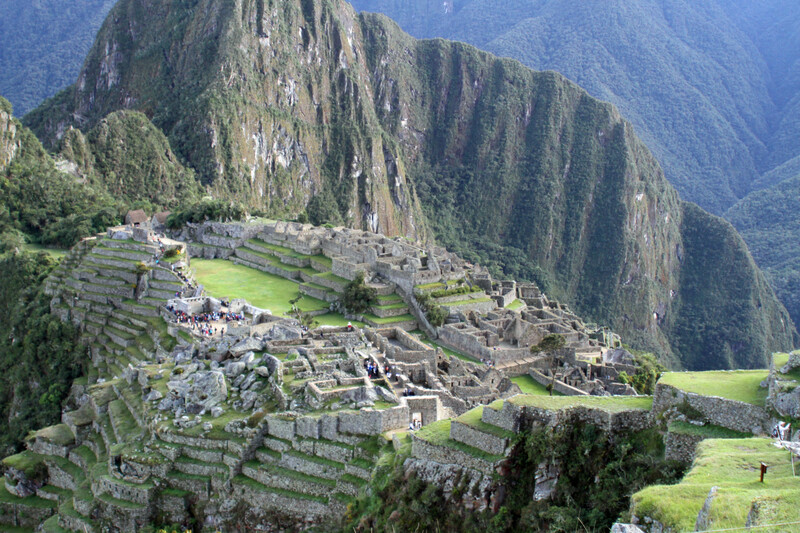 The adventure continues with a flight to Cusco, then on to Machu Picchu, and Ecuador and the Galapagos Islands. These wonderful dancers entertained us during lunch. The Spanish horses at the Hacienda. 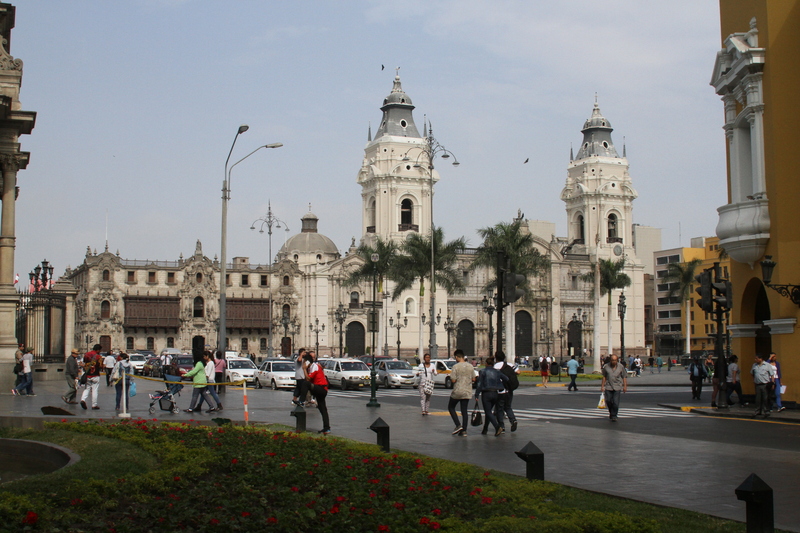 The church in the central square of colonial Lima. 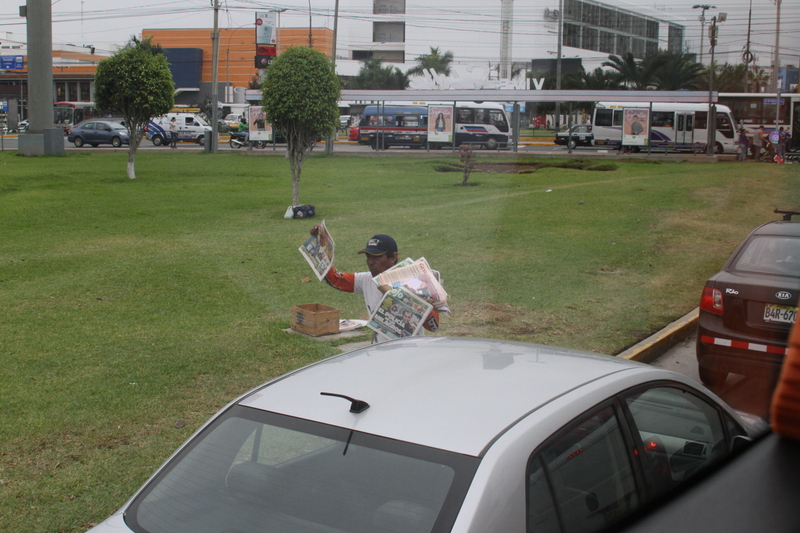 Guys sell water, news, and more to drivers. 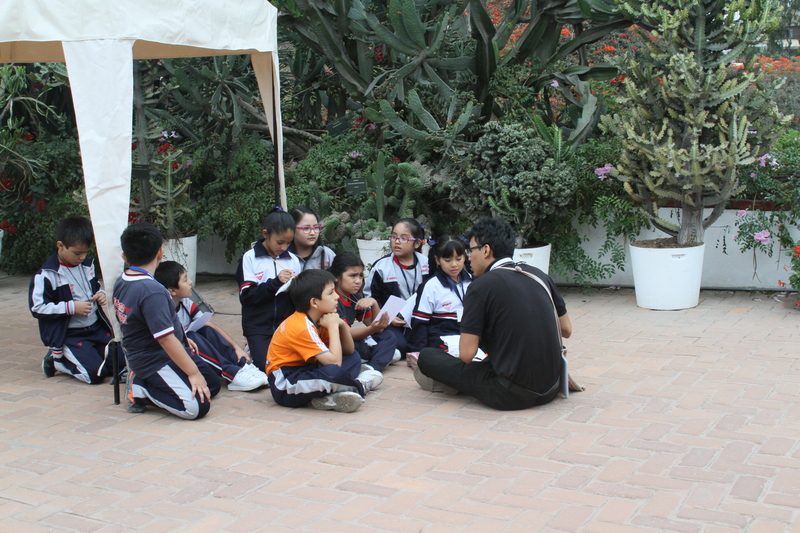 Groups of kids on a school outing at the museum. 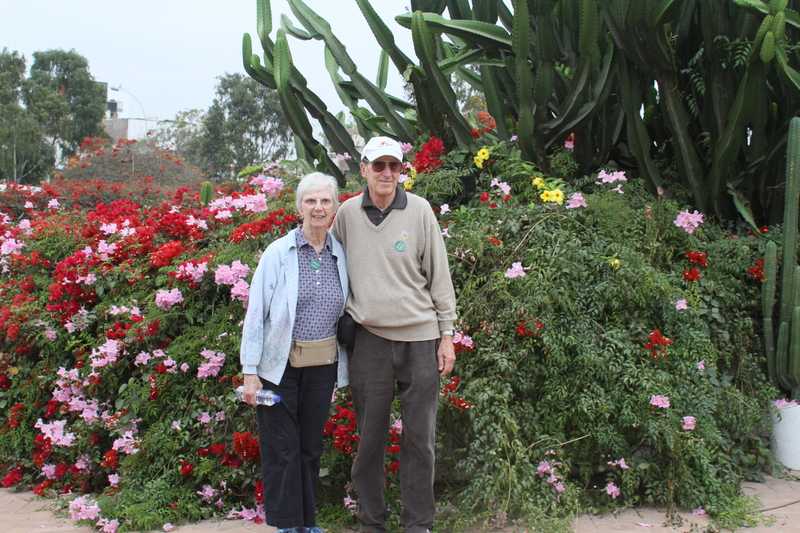 Mom and Dad at the beautiful museum. 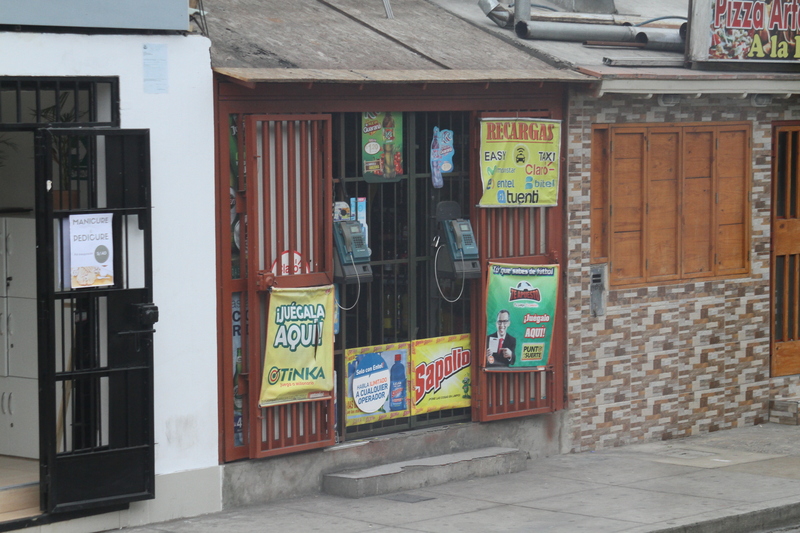 A shop waiting to open. The houses were build on arrid land by squatters. 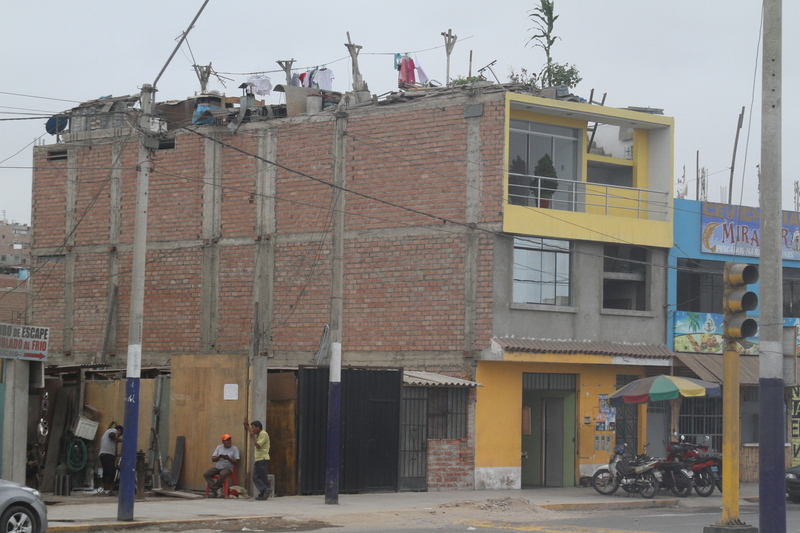 A house gets built slowly in Peru and laundry is done on the roof. 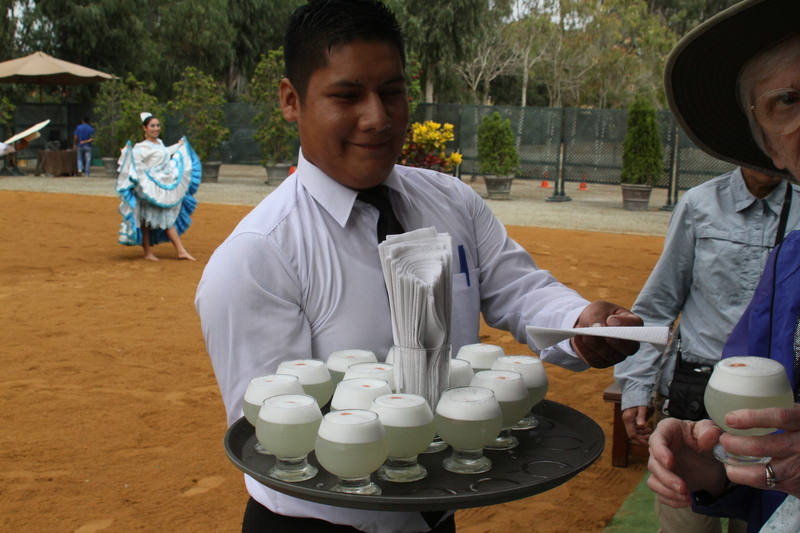 Pisca Sours, a favorite drink in Peru. Yum. 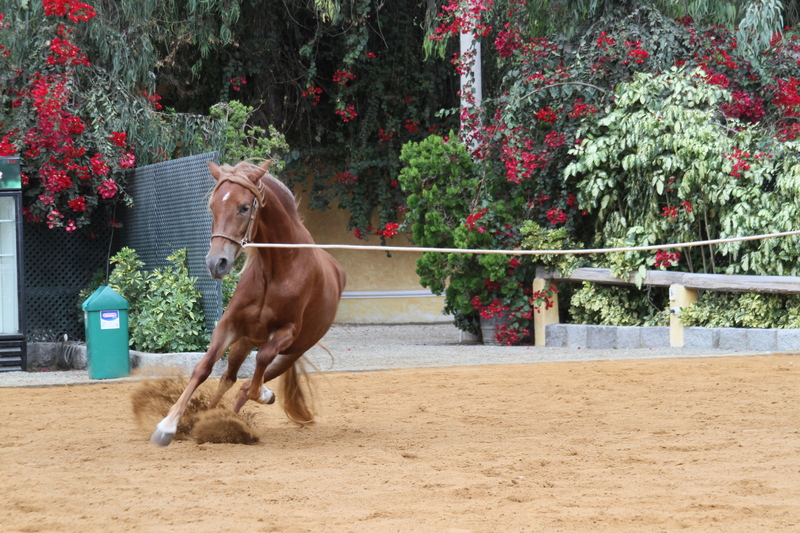 Training one of the young horses at the Hacienda. 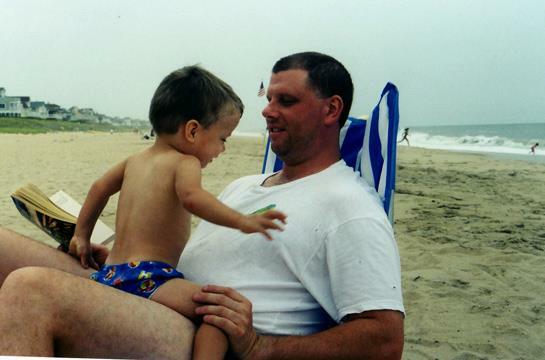 Five years ago today I lost my only sibling and someone I loved and admired very much. 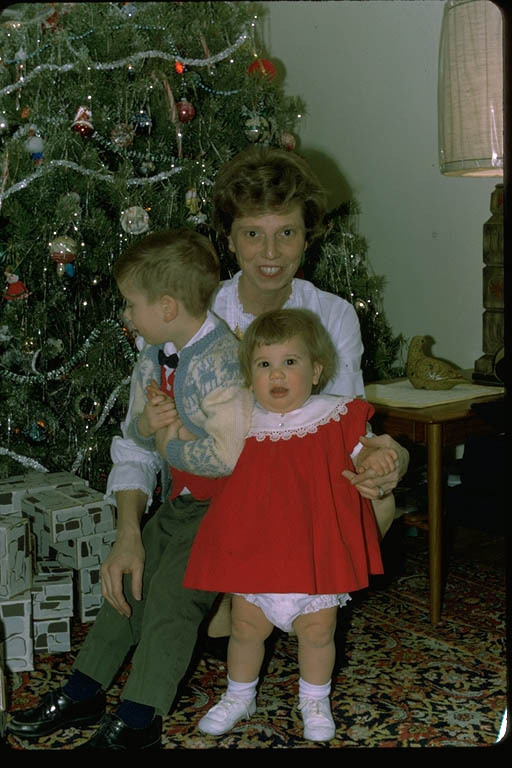 During those first weeks and months the tears flowed endlessly and still today, the pain is just as intense, but it comes less frequently (although still too frequently). I once read someone’s account of losing a loved one and it was very relatable. Grief is like a tsunami that pours over you with enormous pain. In the beginning, the waves come regularly and frequently. Over time, the waves come less often but the intensity of pain when they hit is still as strong as those first hours and days. Much has happened since that awful day. 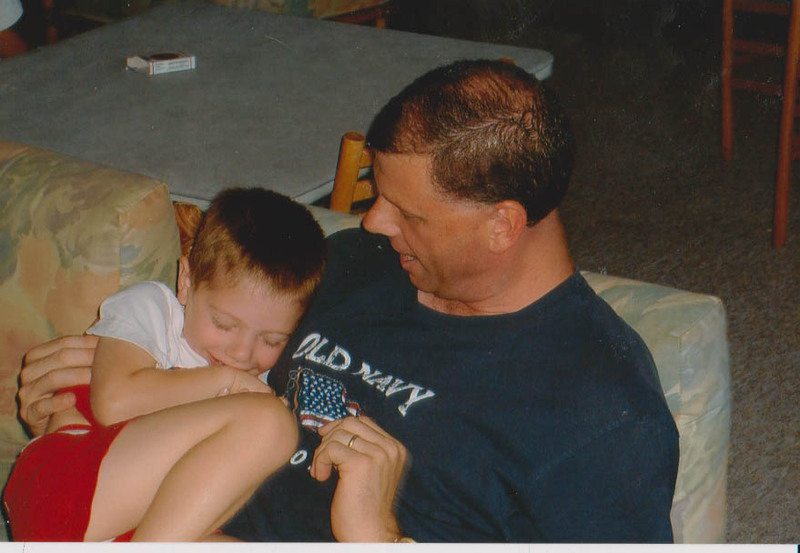 I wonder what Greg’s life would be like if he had lived and as much as I would wish him back in my life, I wrestle with knowing he is healed and where he ultimately intended to be—with our Lord in Heaven. 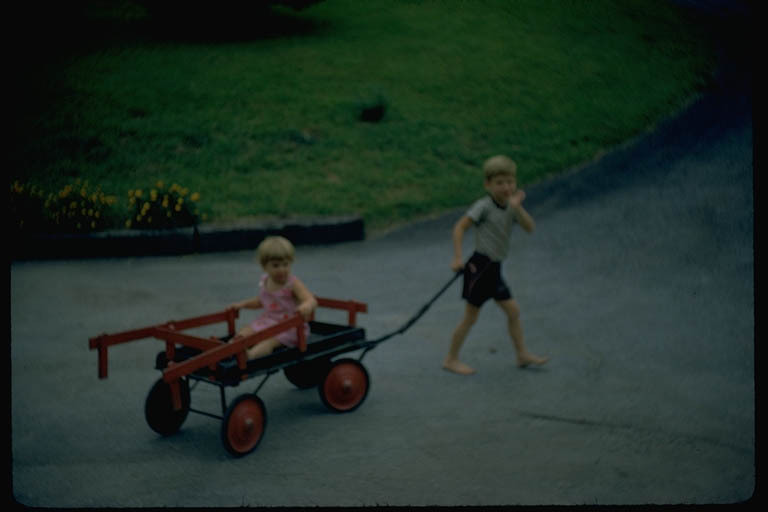 I remember many prayers I asked God for concerning my brother. I wanted his relationships to heal, his body to heal, and for him to find peace and happiness. 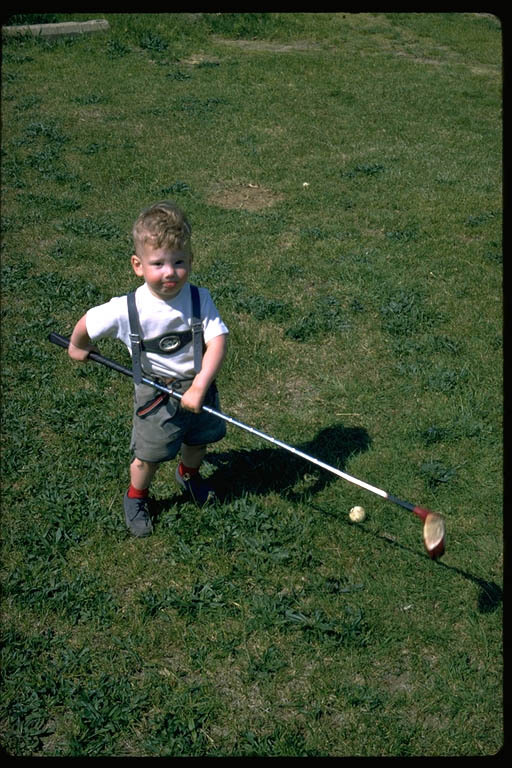 And while he left us too soon (from our perspective), God healed him. He now feels no pain, he is with our Savior, and is awaiting us all in the Kingdom. 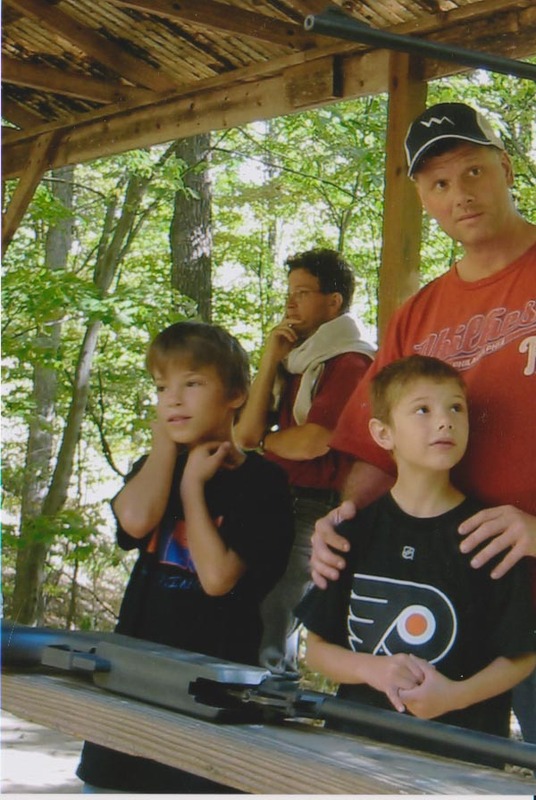 So, I still spend some nights crying because he is gone and because of the fall out of being separated from some of my family members, and for the kids and my parents missing their father and son. 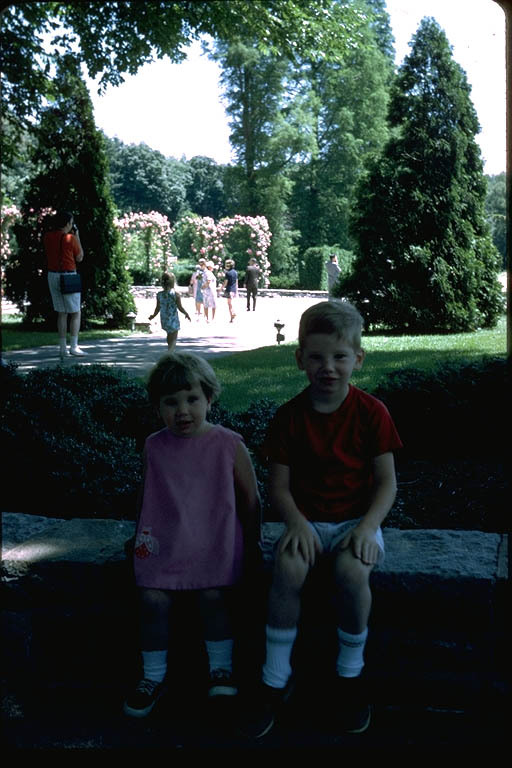 But, I will always be grateful to God for giving me the best big brother a girl could ask for. 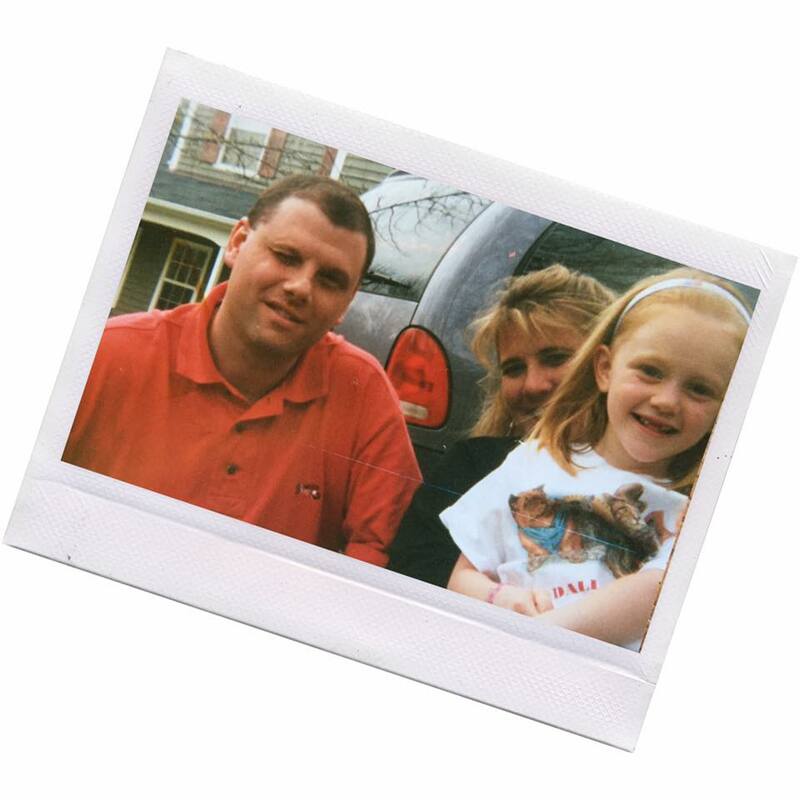 In Greg’s memory, our family created a charity called the Masterpiece Fund. We are honoring the character and principles my brother stood for by giving funds to people throughout the world who need love and support. Greg’s last bible study included a scripture reading from Ephesians 2:10 which inspired the charity.